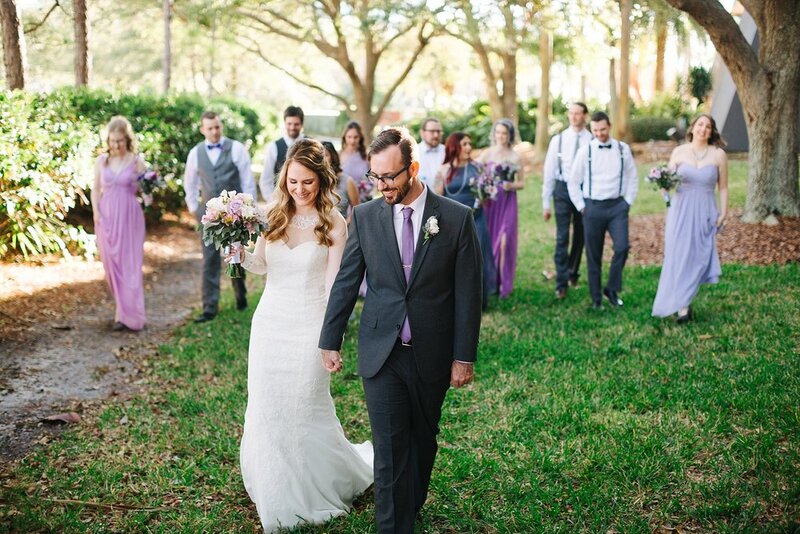 Surrounded by friends and family, Tyler & Aimee said "I do" on a beautiful Spring day back in April at the Davis Island Garden Club. 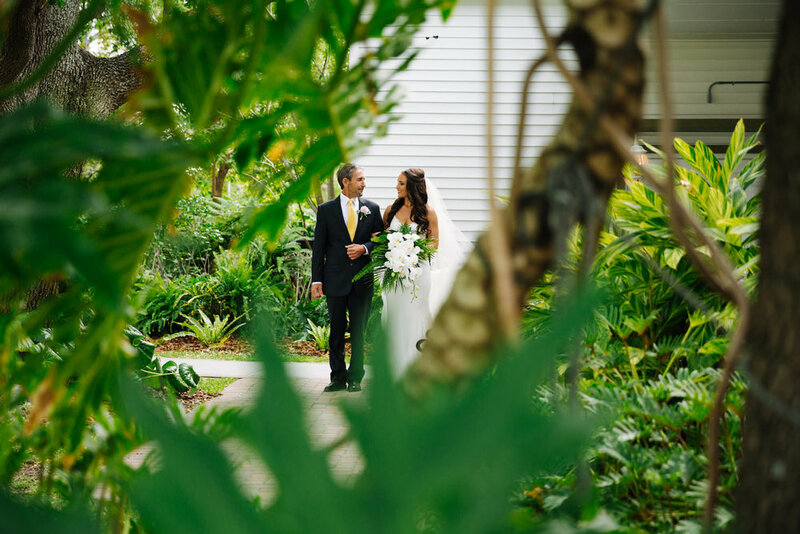 "We chose Davis Island Garden Club because it was beautiful, raw, and allowed us to piece it together how we wanted. 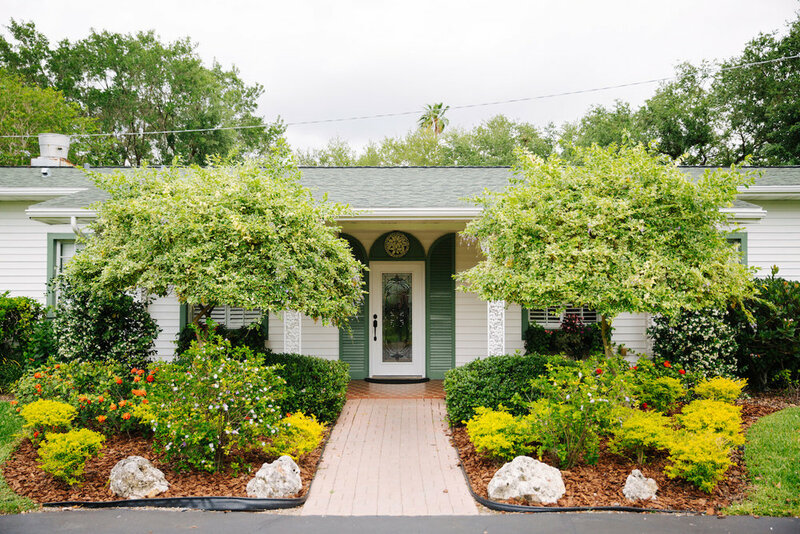 We loved that there was a ton of green grass, a view of the river, and a great location near downtown Tampa for all of out-of-town guests. 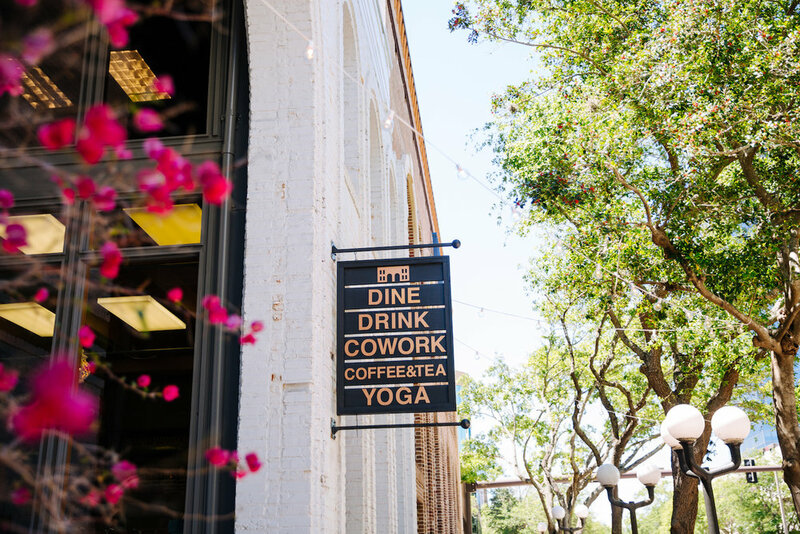 DIGC was a blank canvas for us and really let us (and my mom- the florist) create our vision. 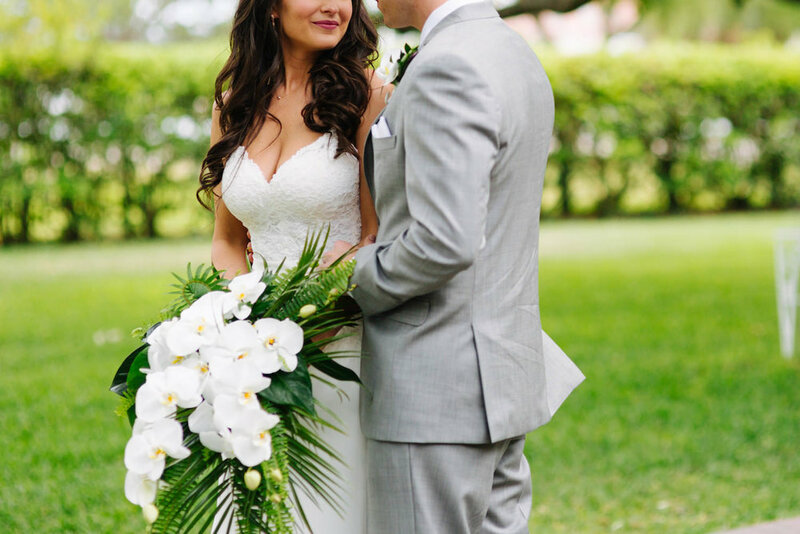 Aside from that, we really wanted the rest of the wedding to be very simple and clean with all white table clothes." 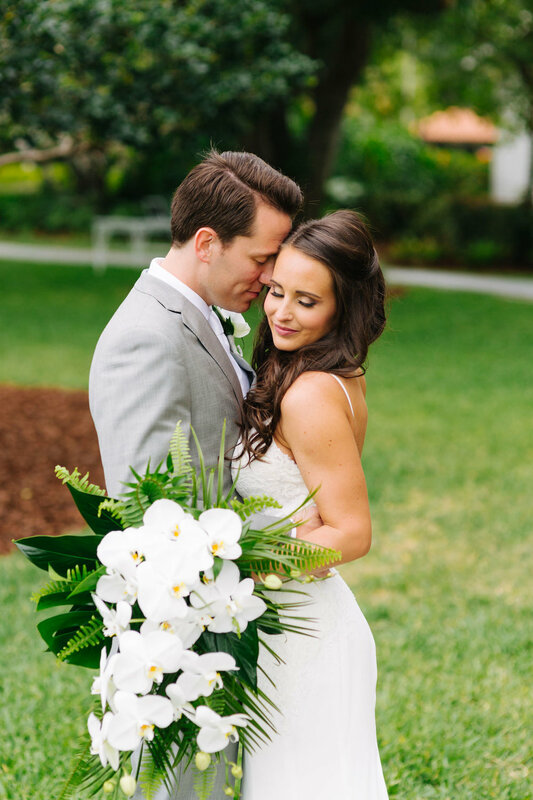 Taking inspiration from the proposal in Maui, Tyler & Aimee's wedding featured beautiful tropical florals, including orchids, by Aimee's mom. My grandparents used to live in Hawaii and while they were there they grew orchids. When Tyler proposed there were orchids spread all across the beach. 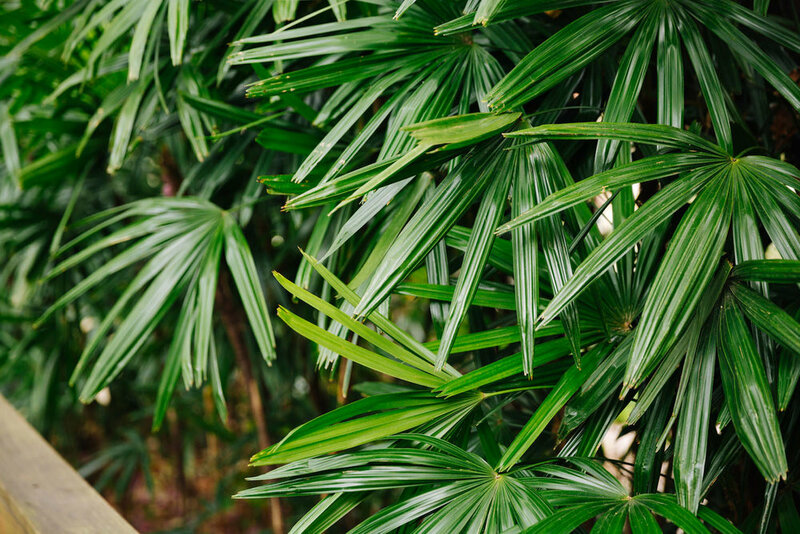 We incorporated tons of tropical flowers (many even flown in from Hawaii). My bouquet and the ceremony toss flowers were all orchids. 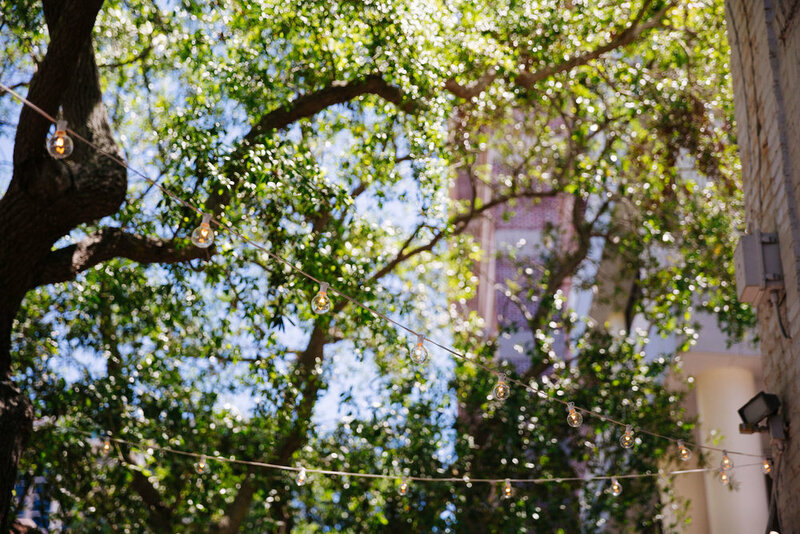 Try to take in every moment. I know everyone says it flies by, but it truly does. 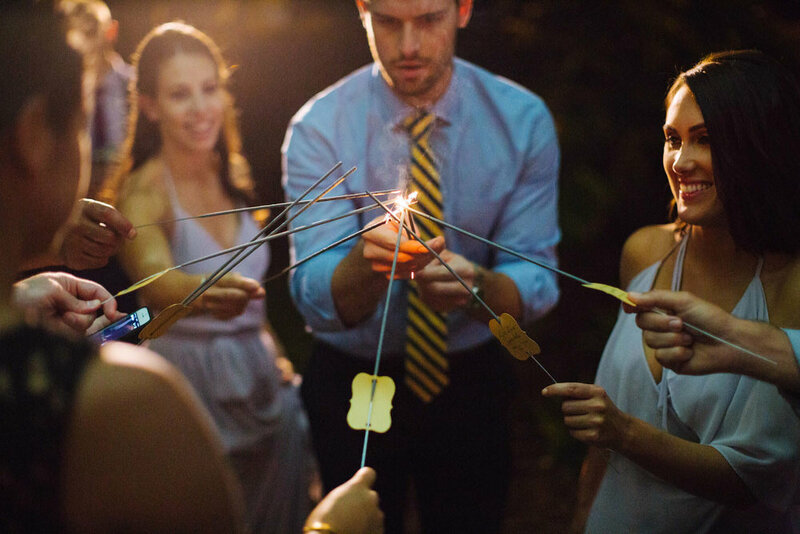 Try to especially cherish the moments in the morning with your family and bridesmaids, because it gets hectic when things get rolling. Those moments just relaxing, laughing, and crying with everyone that morning was so special. I loved having everyone there with me that day. 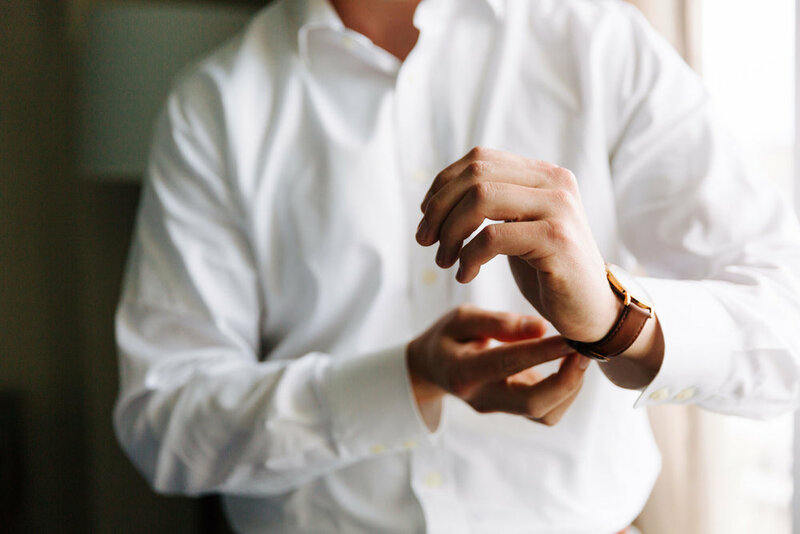 Everything takes a little bit longer than you'd think (particularly getting your groomsmen together and on the same page). 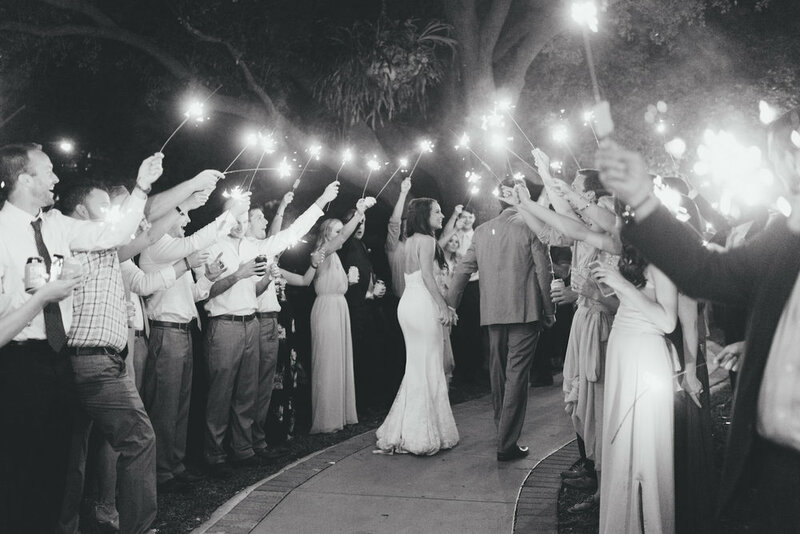 What were some of your favorite memories from your wedding day? 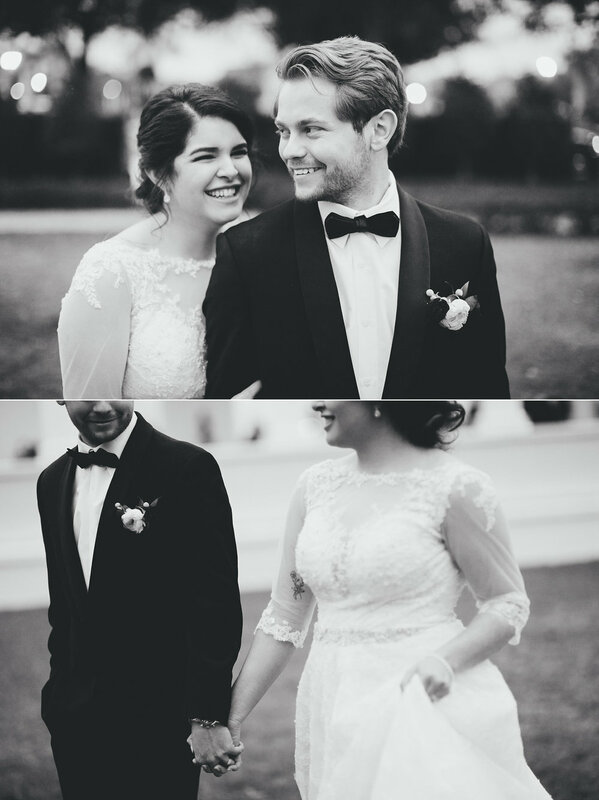 Both of our favorite memory was the first look. We were on the fence about doing a first look because we were wanting to be traditional. At first we felt like we were just doing it for logistics, but we were so happy we did because it ended up being the best part of the day. 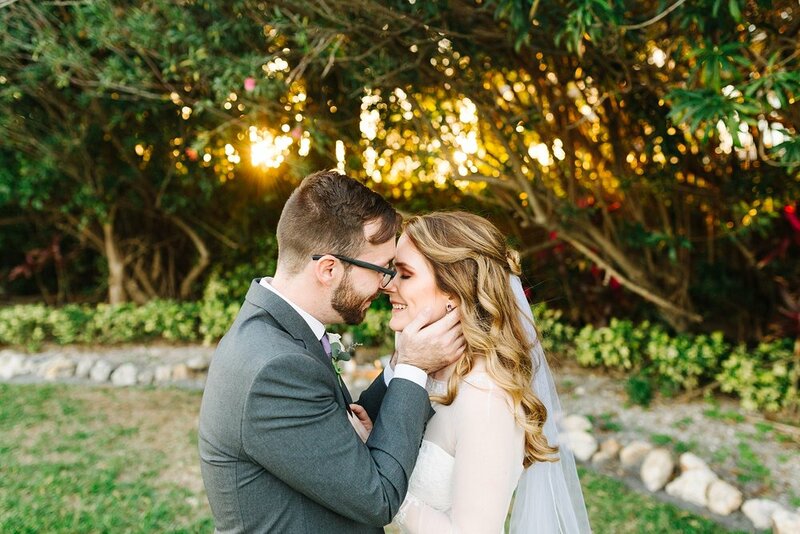 It was calming to be able to see each other and to be able to spend time together and with our closest friends and family together before the ceremony. I loved having these 10 girls by my side for the wedding day (and for their help with all the decisions leading up to it). Those moments just relaxing, laughing, and crying with everyone that morning was so special. Bridesmaid dresses by Joanna August from Bella Bridesmaids. It was really great to have 9 of the most important people in my life together, especially before the wedding. They really helped to keep me calm and relaxed. 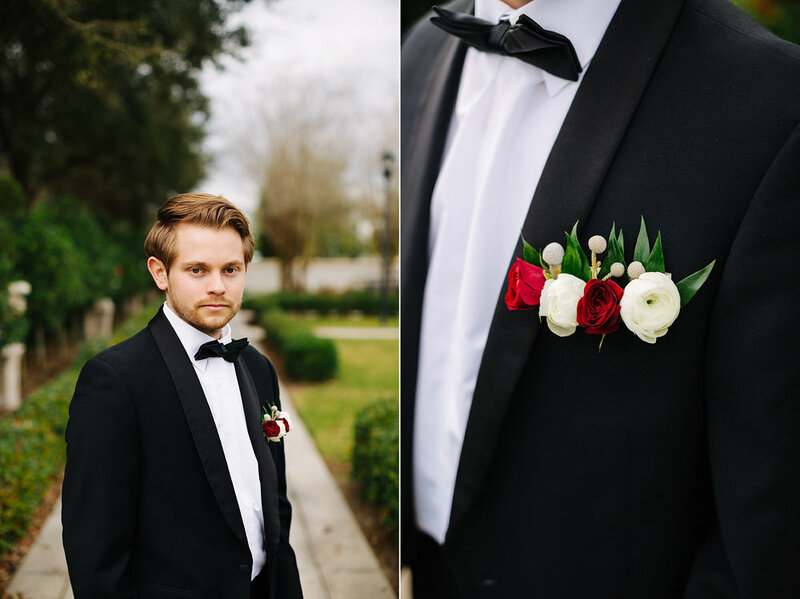 Groomsmen suits from Generation Tux. What is something that happened on your wedding day that you didn't expect? We both didn't expect Tyler to cry. One of our favorite things we did for the wedding was having craft beer. We picked a beer from where we met in Gainesville, FL (Wild Nigh - Swamp Head Brewing Company), where we got engaged in Maui, HI (Big Swell IPA - Maui Brewing Company), where we started a home together in Nashville, TN (Lovebird - Jackalope Brewing Company), and where we got married in Tampa, FL (Florida Cracker - Cigar City Brewing Company). 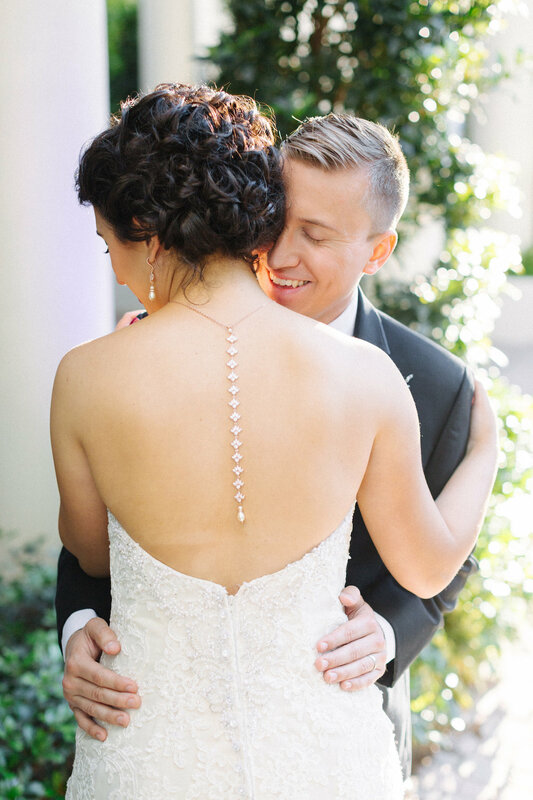 My necklace was a wedding day gift from Tyler. Tyler's suit was purchased from Generation Tux. 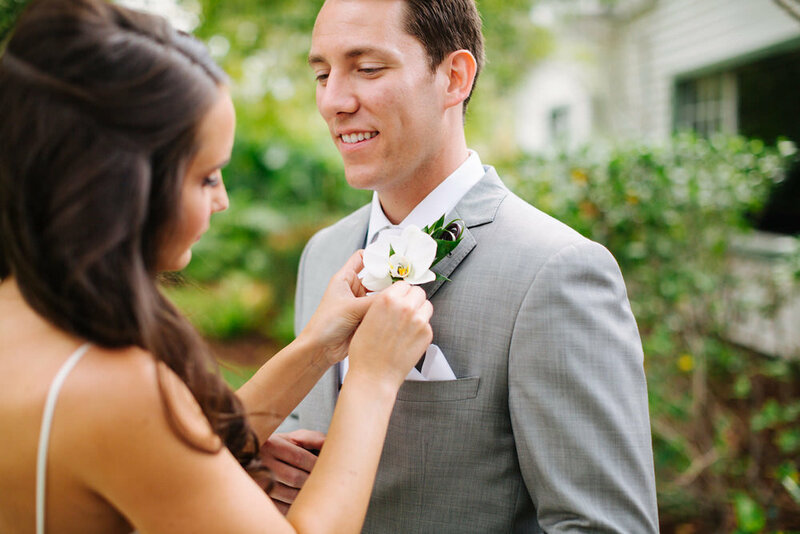 The collar stays and the tie bar were wedding day gifts from Aimee. 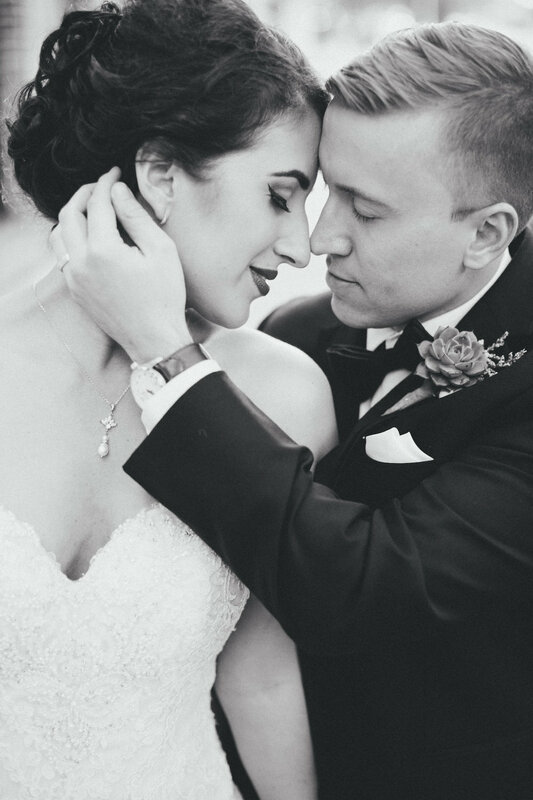 The collar stays had words engraved from the song Aimee would be walking down the aisle to, "Take my hand, take my whole life too." 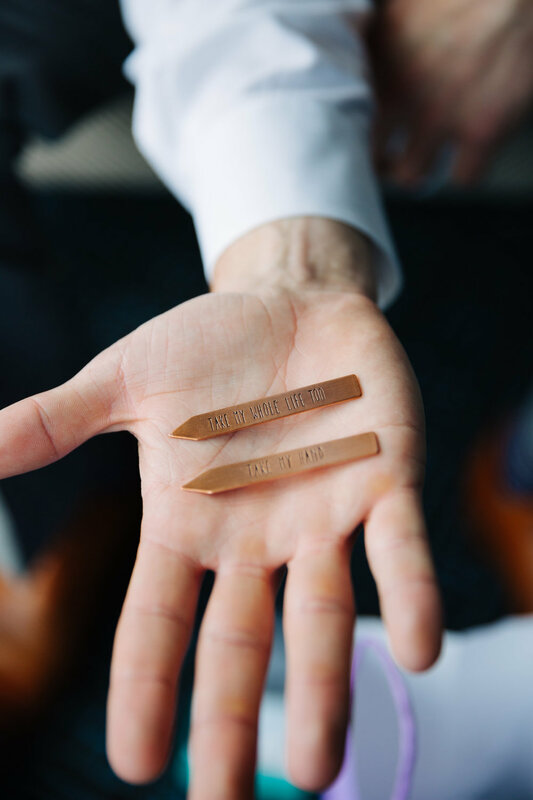 And the tie bar had our wedding date engraved on it. 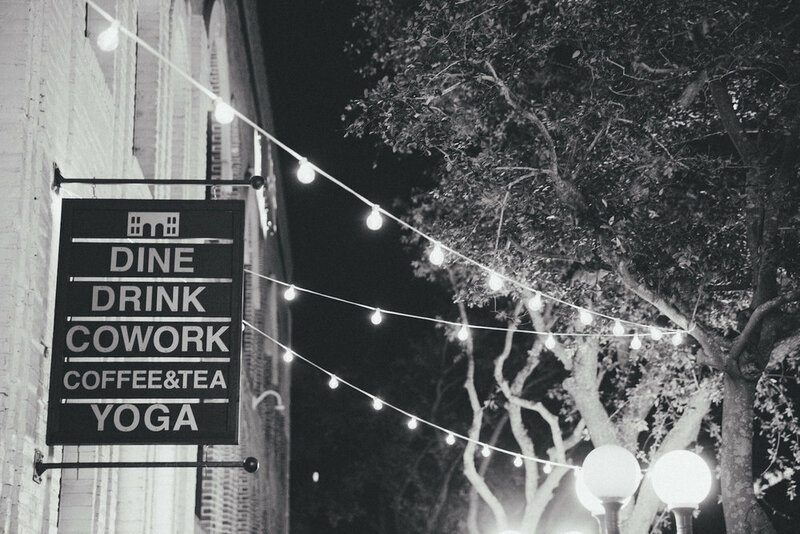 We loved being able to dance outside under the market lights on the patio. The DJ played WipeOut (a favorite song of my Grandpa) which was a surprise for him for their entrance into the reception. 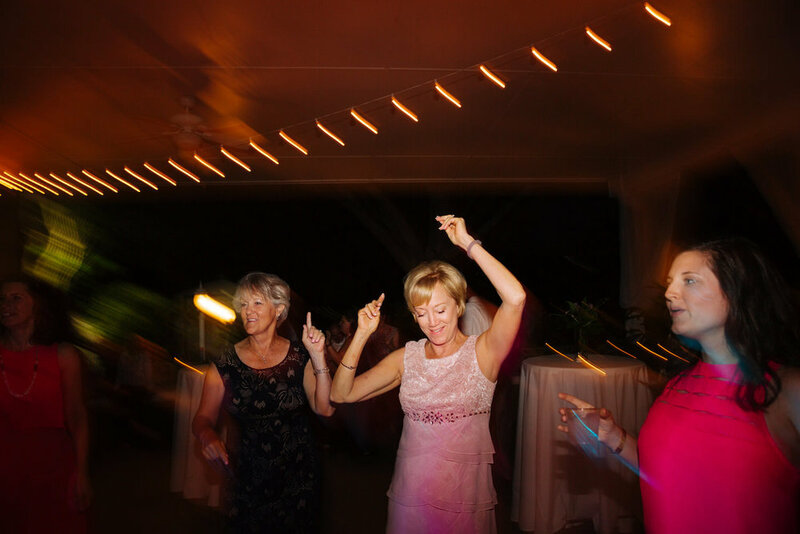 And my grandma's favorite song, The Chicken Dance has always been a fun family tradition. We are so thankful for all of the help we received from our family and friends. 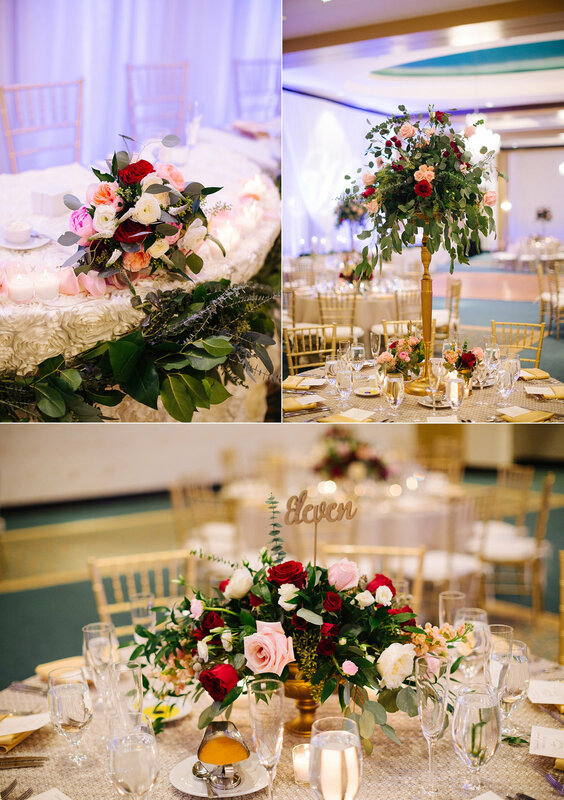 Particularly, Sherree for somehow managing to be mother of the bride and also an incredible florist and knocking the flowers out of the park. She drove down from New Jersey (where her flower shop is) with a car full of supplies to make it happen! 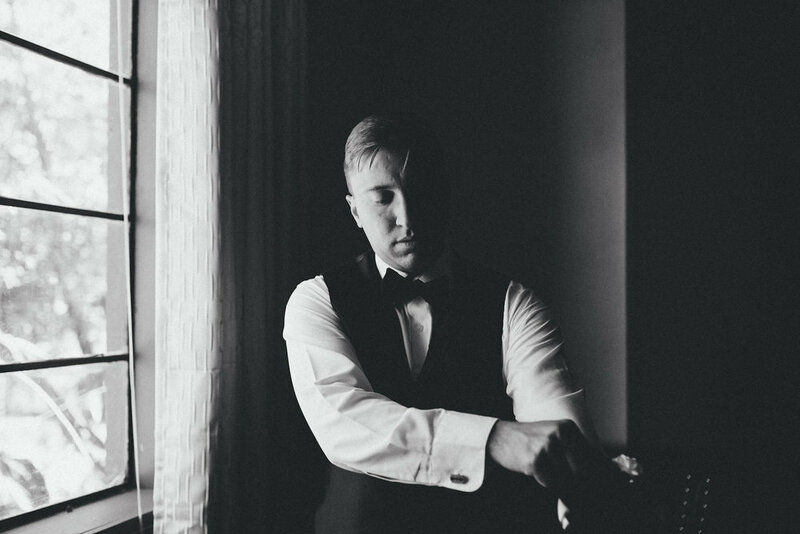 And Bob for making sure everything was perfect on the wedding day-- we think he probably sweat through several shirts that morning. Cheri and Jack for an amazing rehearsal dinner, and for the Sunday afternoon get together to really cap off a perfect weekend. Special thanks to Kerry and Spenser for their artistic talents and for moving the beer canoe stand about 15 times. Don, Judy, and Mary Ellen for making the beer canoe and canoe stand that held the most precious items of the night! And then of course our floral team of Kelee, Jessi, Grandma, and PopPop! Who made this day happen? 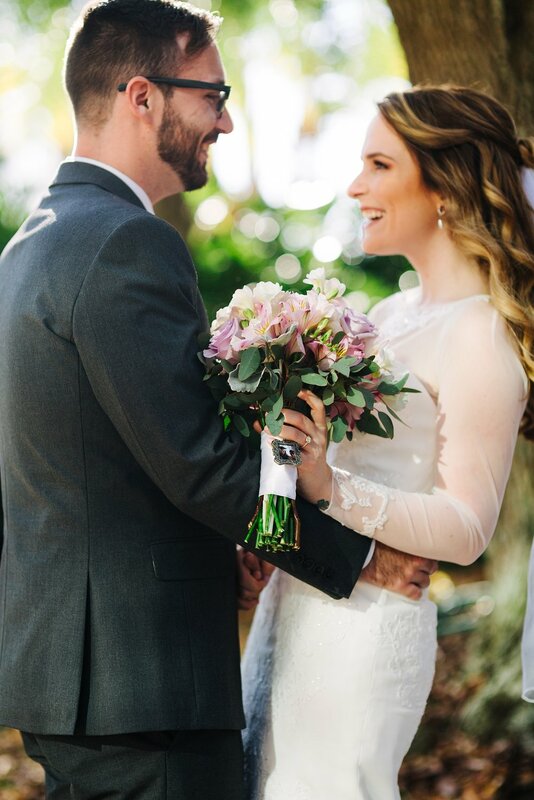 Danny & Lauren said "I do" on a beautiful day back in February. 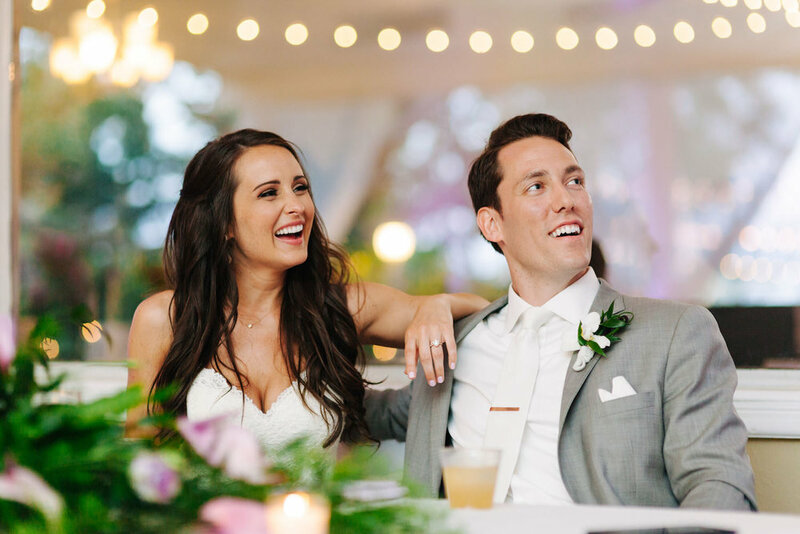 These two have sweet hearts and it shows so evidently in their images, from their emotional first look to some fun surprises throughout the day. Lauren was going for "vintage romance" with her long sleeved dress and loose curls. 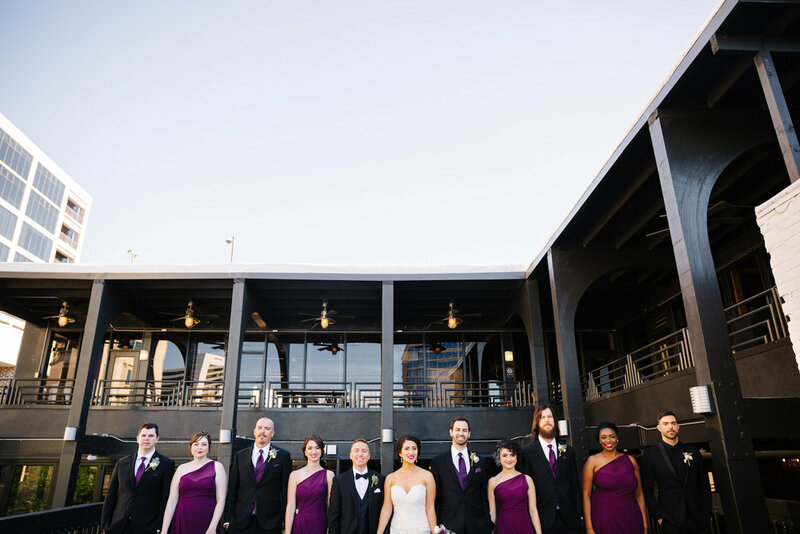 They included purples and grays to go along with their vintage feeling of their wedding. "We both are quite shy so deciding whether or not to write our own vows was a tough one, but in the end we're really glad we did. It lead to shared tears and a few laughs!" Danny was completely sneaky and surprised me during our first dance by having my friend Rachel (of the country band Gloriana) sing our song. I started out as her fan, and we turned into friends over the years, so this was beyond special for me. I remember the day he brought the keyboard they used into our tiny house and I threw a fit because there was no room for it. I take that back now. Danny is a musician, so I didn't think twice about it. It was just the greatest surprise and I'll never forget that moment. Why did you choose this venue for your reception? Living in Florida, we didn't necessarily want to get married on the beach, but having the water right off the Rusty Pelican was just enough. 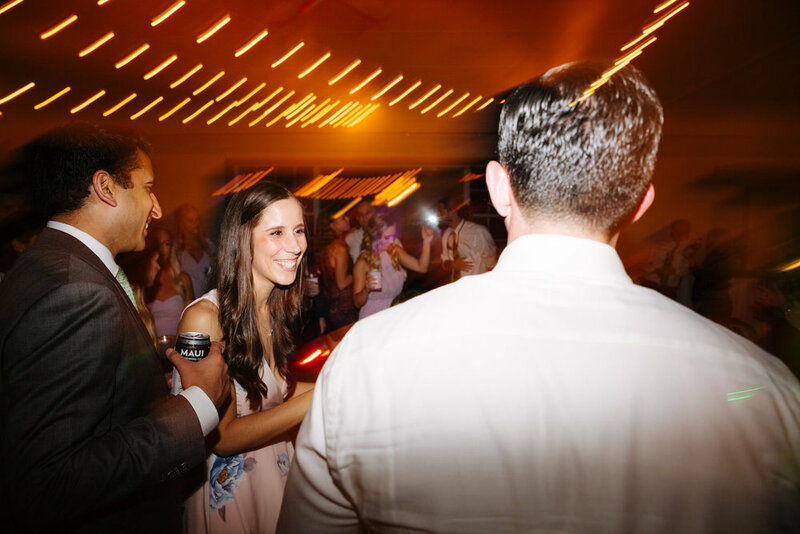 It had that vintage vibe (and lots of chandeliers) that we were after. 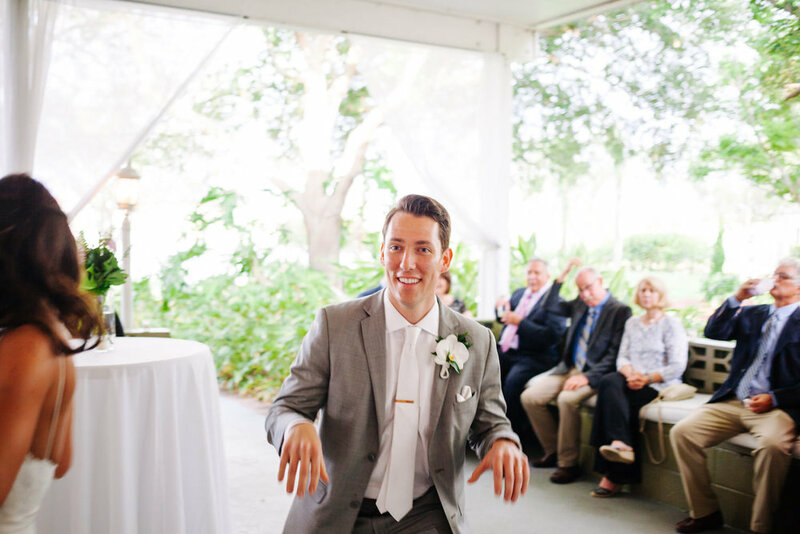 What were some of the funniest memories from your wedding day? Our flower girl slept during the entire ceremony.Our ring bearer dancing to Beastie Boys and owning the room, Best Man #1 and Best Man #2's speeches (go Team Suspenders and Team Vests). 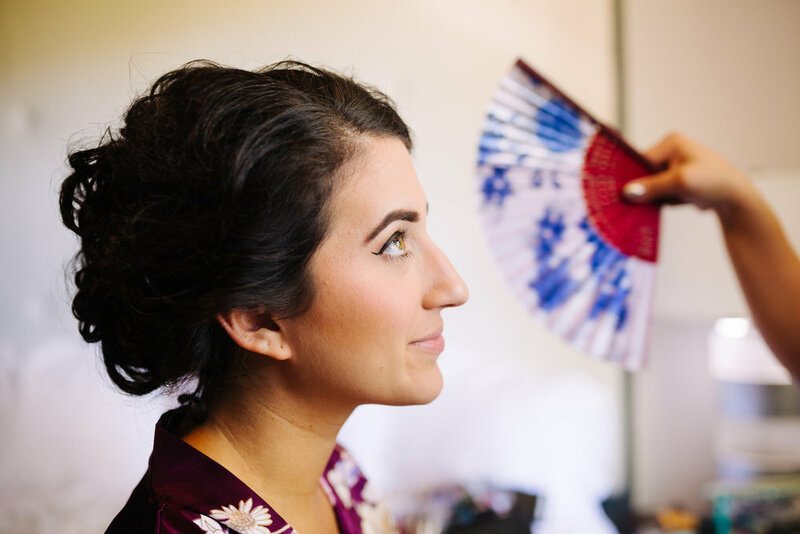 What is something that happened on your wedding day that you didn't expect? Lauren didn't cry as much as she thought she would. Or at all during the first look. The happiness just completely takes over. Is there anything you wish you knew? As everyone says, it really does go by very quickly. Especially the ceremony. You probably won't be able to say hello to every single person who came, even if that's your goal for the evening. 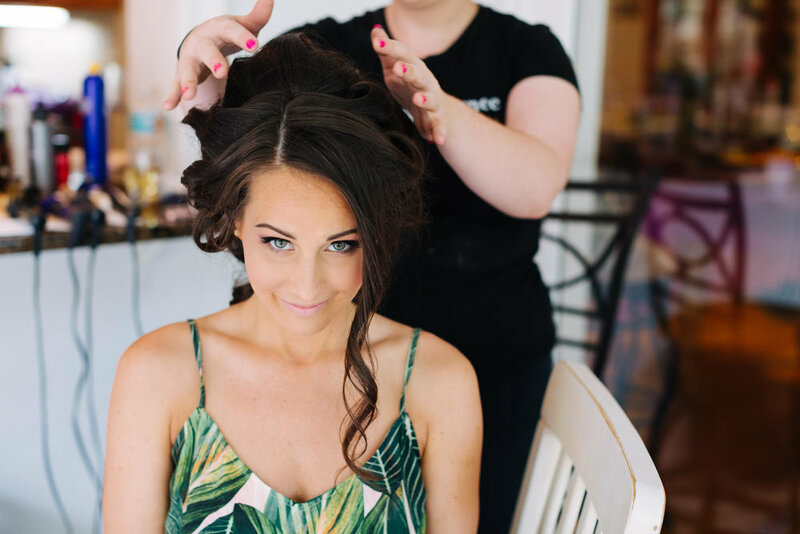 Advice for future brides: Worry about yourself. I spent the better half of our year of planning worrying about everyone else and if they were happy. Make sure YOU'RE happy. Have someone field phone calls and texts day of (thanks sister-in-law Angie!). If your ring bearer and flower girl are under 3, have every expectation that they won't make it down the aisle so when they do just want to take a nap at the last minute, you aren't freaking out. 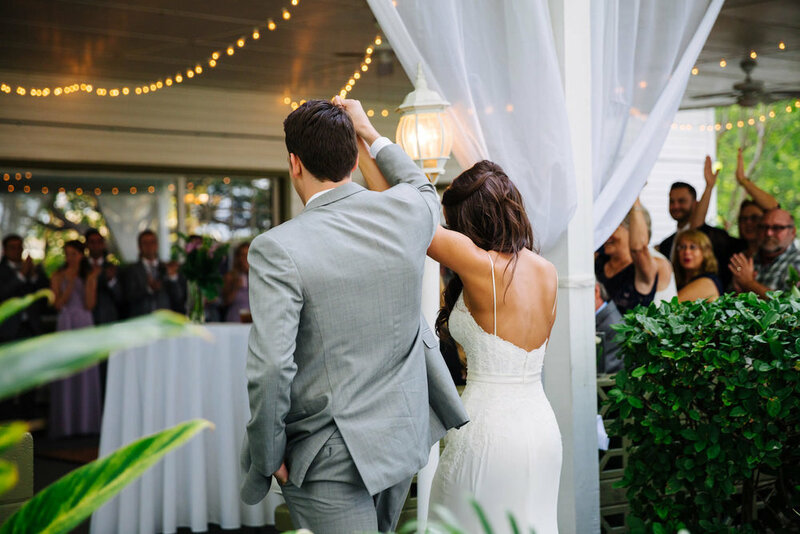 Advice for future grooms: If you have a unique song for your bride to walk down to make sure you double check with the DJ that they have the right song! Good vendors are invaluable. They will make your day go so smoothly. Everyone says this is the brides big day, but it's your day too. Make sure you enjoy it! The Bridesmaids. 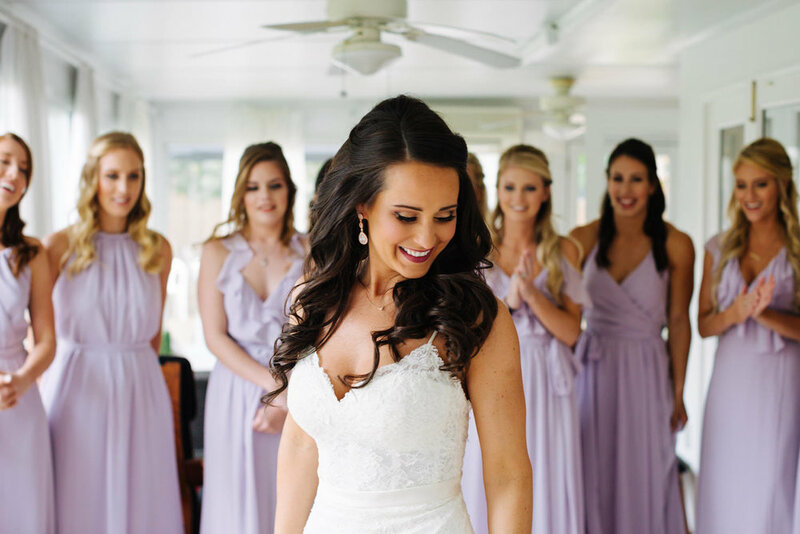 I chose my cousin (who is really like my sister), Amanda, two step-sisters, Jaime and Deneen, two best friends since middle school, Alyssa and Elizabeth, and my new sister-in-law, Angie, to stand beside me. Their dresses were from David's Bridal. I wanted them to pick out what they wanted, what they felt good in. I didn't want to force anyone into something that would look good on one, but not the others. 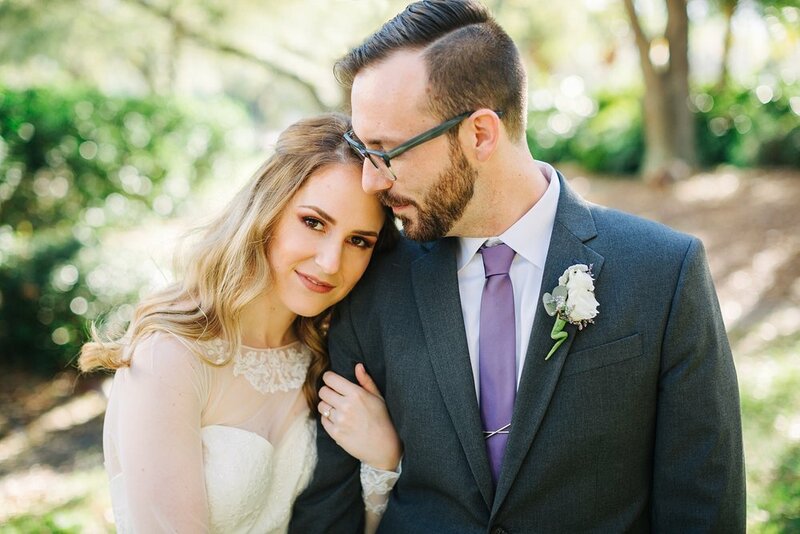 Not seeing their mix-matched colors until the day of was stressful, but boy did it work! I remember seeing them for the first time after our first look and I was just so amazed at how beautiful they all looked. I gifted my maid and matron of honor Kate Spade bracelets and all of them personalized hangars and robes. The Music. Fun fact: the song I walked out to during the processional was wrong! There's a picture somewhere of Danny telling Kasey it wasn't right. Knowing the story behind that photo makes it all the more funny. Everyone who knows Danny knows that he's the biggest Star Wars nerd so walking out to anything but something from the movies would have been wrong. We exited to the Throne Room theme song from A New Hope. Thanks goes out to... Aurora and Victoria from Euphoria for doing such an amazing job on everyone's hair and makeup, Cassie at Wonderland Floral Art for our beautiful flowers and centerpieces, everyone at the Rusty Pelican who helped our night go smoothly, our wedding party for setting up and breaking down our reception, Gerrit at Messersmith Films for capturing our day on video, Sharon at Frostings Etc for working with us on our DELICIOUS cupcakes, Aunt Lynn for baking the cookies we gave as favors, our parents, best friends and family for their love and incredible support, and lastly, Jake & Katie for capturing our most perfect day. Even the bits we missed out on in-person. 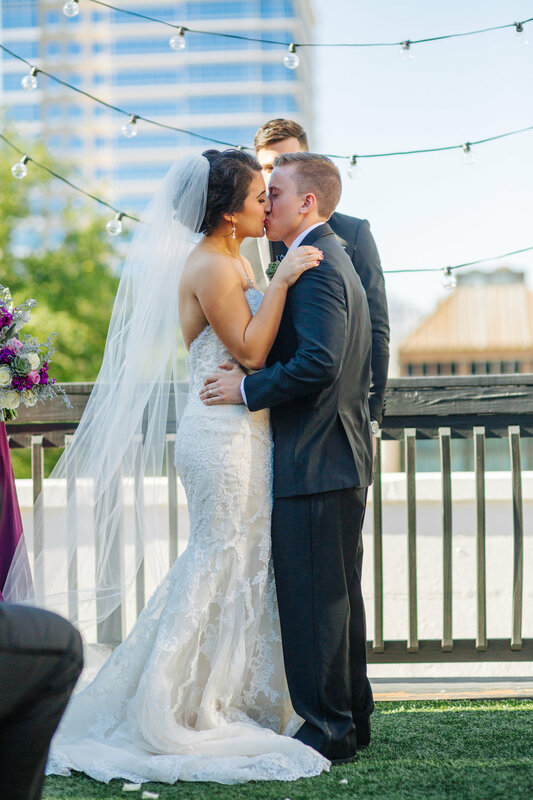 Getting to relive our wedding day thanks to your pictures has become a new hobby (no shame). You made us completely comfortable in front of the camera. We can't thank you enough!! Why did you choose this make up artist? Aurora is a part of the family, and her style is exactly what I was after. Bringing along Victoria was an added bonus! Why did you choose this florist? 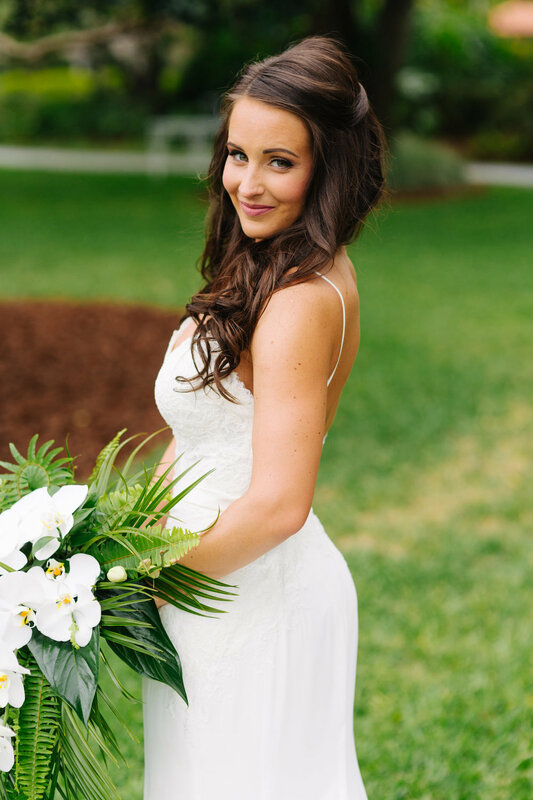 Cassie made the floral planning fun and not stressful AT ALL. She even had flowers to give us a real idea of how our colors would all work together. Being a visual person, this was a big deal. Other vendor details: Alyssa Colina (best friend/bridesmaid) designed our Save the Dates. 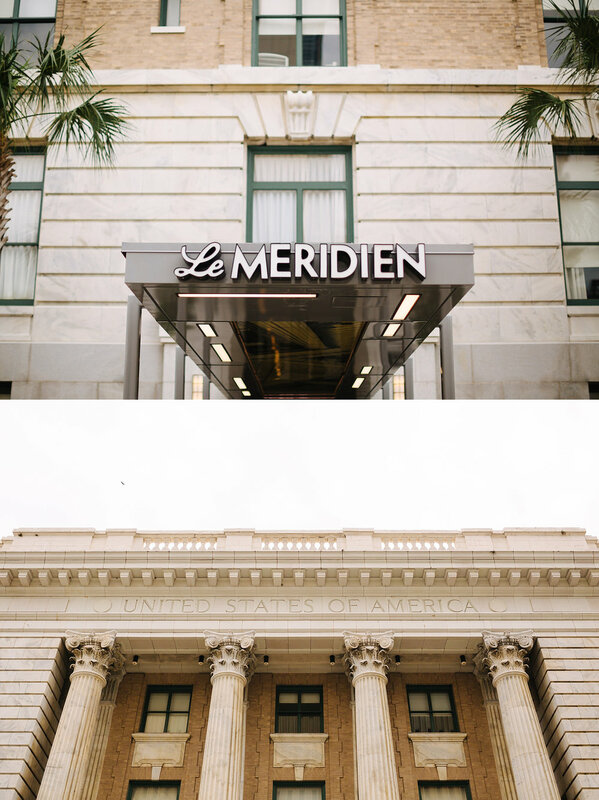 Brett & Amy were married at a super cool venue in St. Petersburg called Station House. 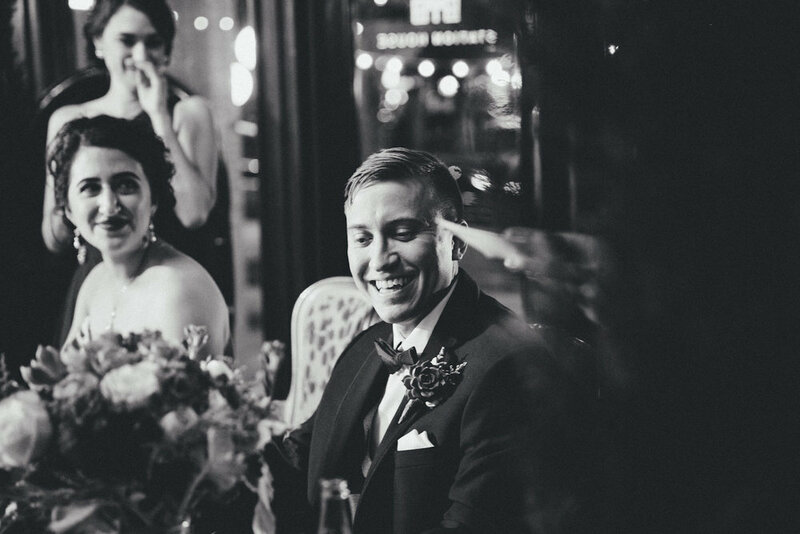 We LOVE shooting at this venue not only because of the awesome aesthetic and atmosphere, but because it allows our couples to have their ceremony and reception in the same location. This is a HUGE time saver and allows for more time for authentic moments, portraits and taking our time to creating real images. 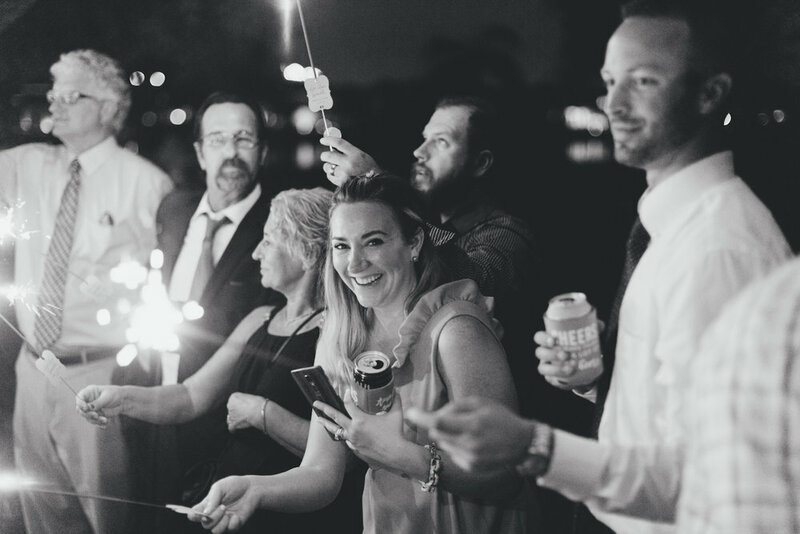 They started things off getting ready with their wedding party and families at yet another super cool spot in St. Pete - Avalon Hotel. This place is so unique and was perfectly fitting for Brett & Amy's personalities. "I loved having the morning with my girls. My bridemaids are my closets friends. I chose them because they are all fun-loving, kind people who are drama free! He wore a tux because I asked him to, ha. He looks so good in a tux! All the groomsmen had individualized cuff links. Brett's cufflinks were a reference to one of his favorite professional wrestlers, Razor Ramon." 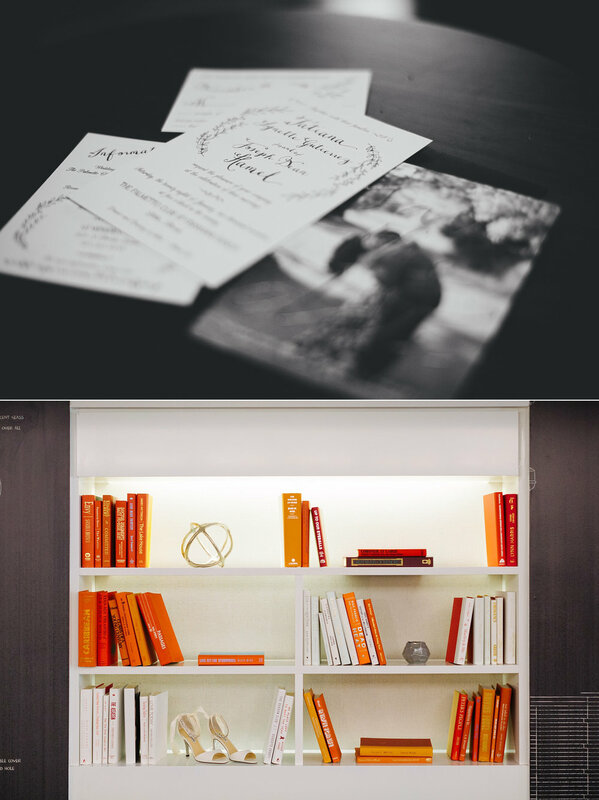 "Station House itself was a huge source of inspiration for me. 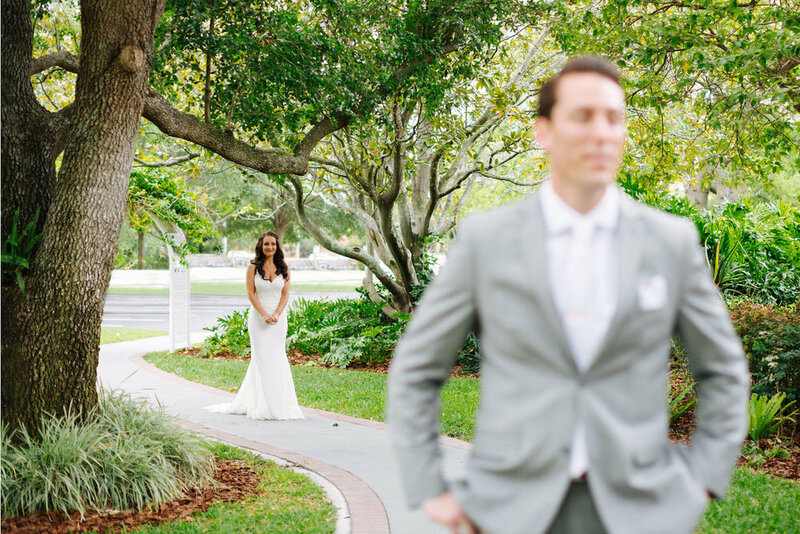 It provided beautiful character we needed to help set the tone of our wedding. 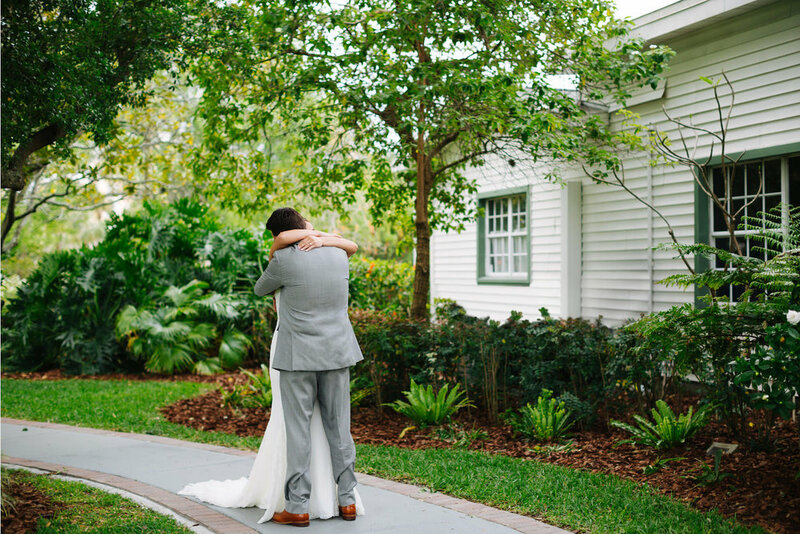 We chose Station House for both our ceremony and reception because they offered different spaces where we could have both and not have our guests have to move to a different location." "I bought my dress at the Dressing Room in St. Pete. 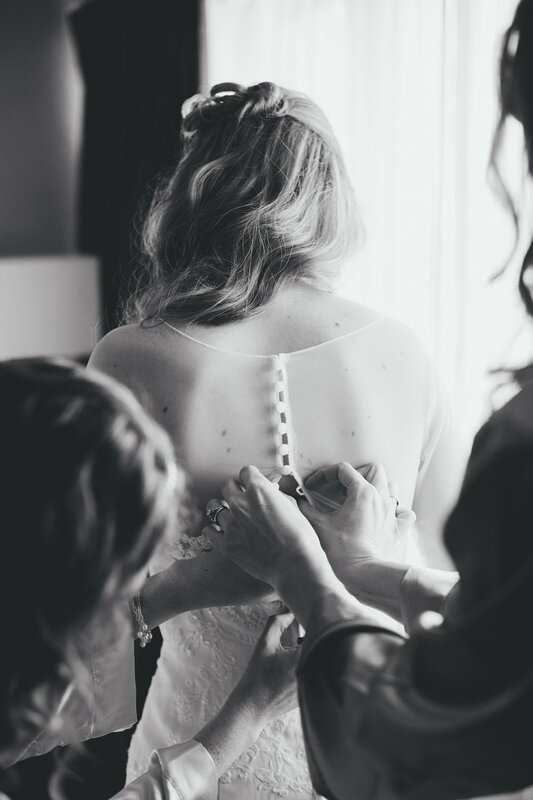 It wasn't what I had envisioned wearing at all -- but once I put it on I knew it was the one!" 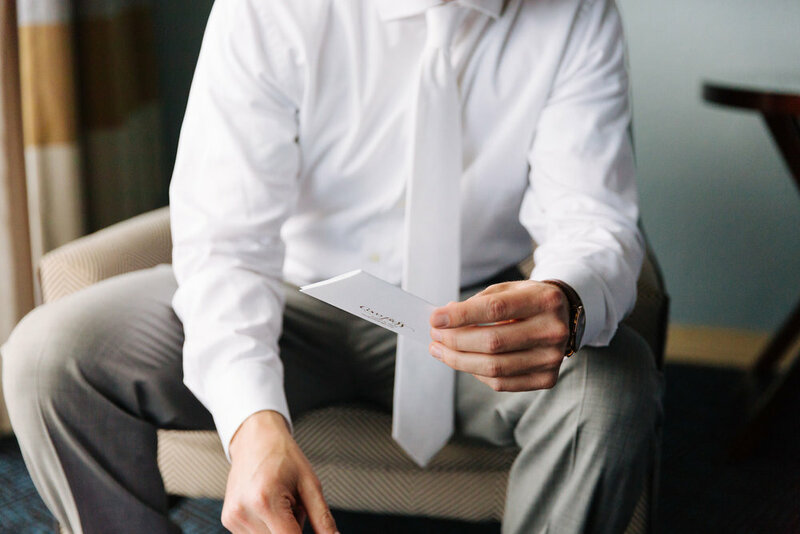 Brett took great care to get a gift that was perfect for each one of his groomsmen. We love how much thought was put into these gifts! Our ceremony was unique because our best friend Nick agreed to officiate it. He was able to speak to our love like no other because he's been there since the beginning. 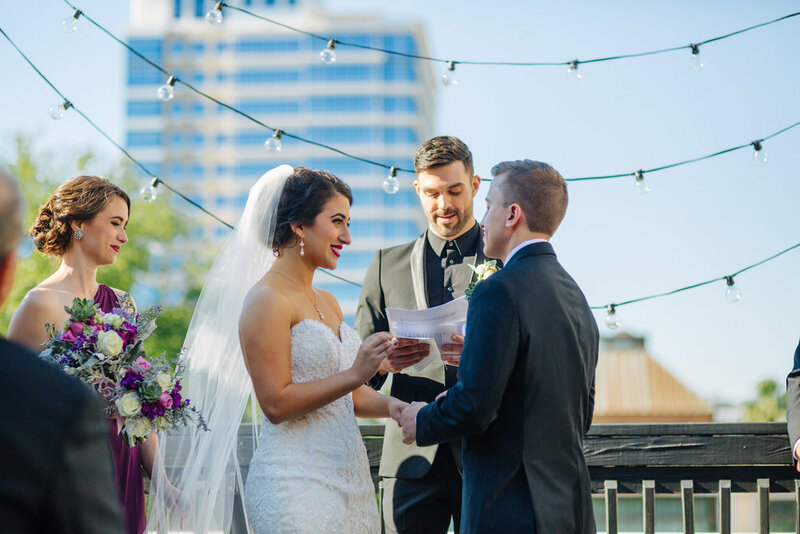 We wrote our own vows and didn't know what the other had written until we heard it at the ceremony. Brett & Amy channeling their inner Queen B. 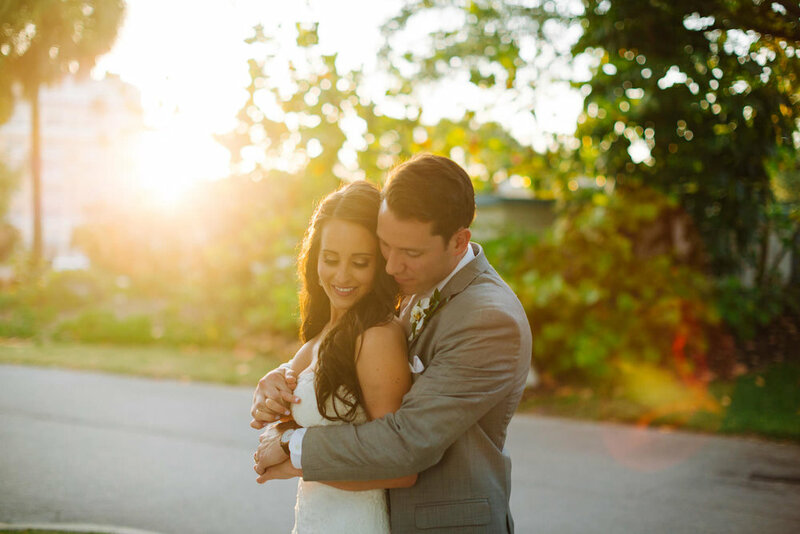 "Our reception was fun and traditional. People had a good time and were always dancing. 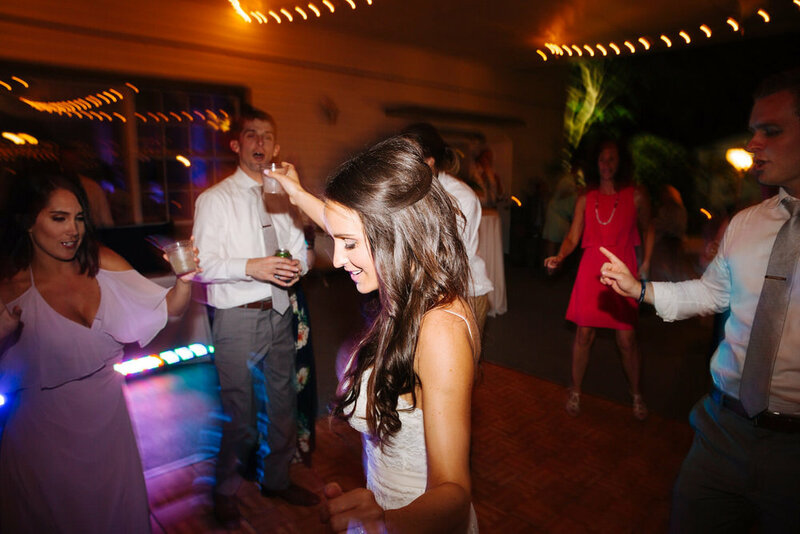 Our first dance was to Tony Bennett's "The Way You Look Tonight." We did a last dance alone on the roof top to Prince's "Diamonds and Pearls." I surprised one of my father's with our first dance song, Sweet Melissa. I'm named after that song (middle name) and my father forgot that I knew that." Amy: I loved having the morning with my girls. I loved all the private moments I had with Brett -- from our little whispers to each other at the altar to our last dance together on the roof. 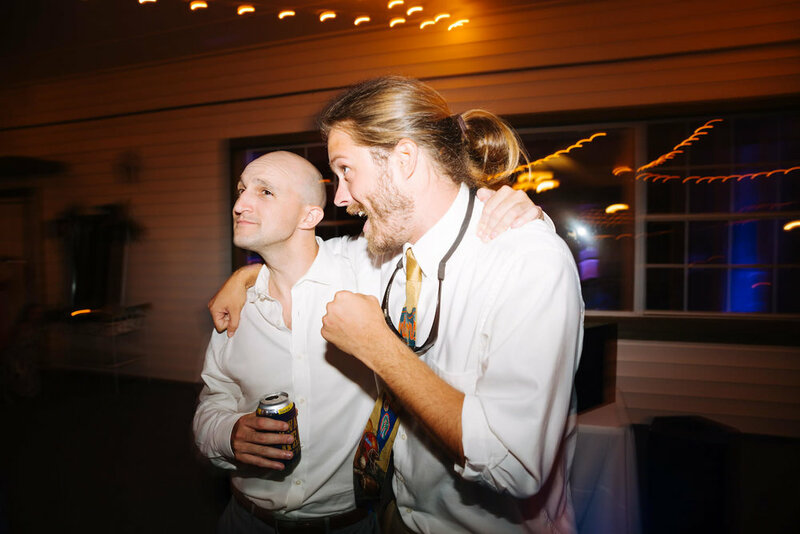 Brett: I loved getting ready with my groomsman. Seeing Amy for the first time in her gown walk down the aisle was amazing. Taking photos with my closest family members, especially my grandmother. I didn't expect the hotel shuttle to take 45 minutes to arrive to take us less than a mile away to the venue, especially after I had spoken to the hotel on 4 separate occasions about whether the shuttle would be available and able to take us to the venue in a timely fashion! The groom and his groomsmen ended up taking Uber! Trust your gut. Try to find common ground in all things -- even things you disagree on. It's not going to be perfect, and at the end of it all you won't care. Our officiant Nick. He's not only our best friend, but was kind enough to become a minister to be the one who made our love official. 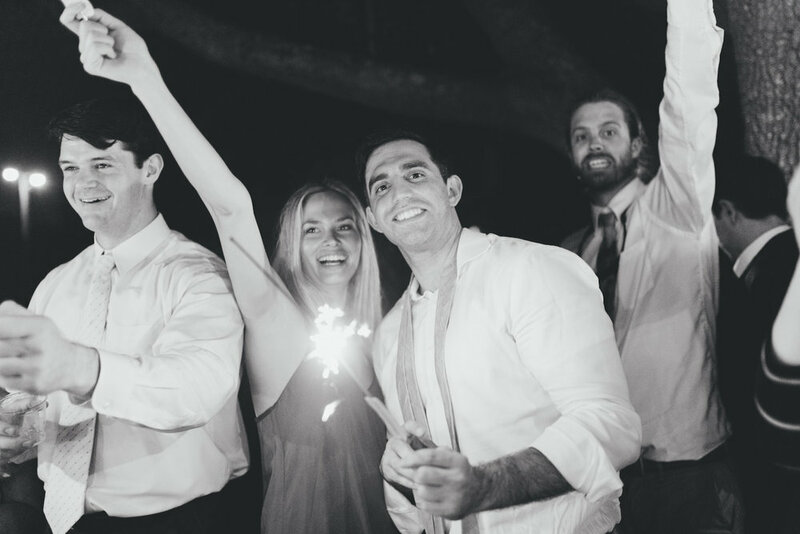 Our amazing bridal party, groomsmen, and their significant! They were all amazingly supportive and there for every step of the way. Also -- our dear friends Kim and Matt Apthorp, the parents of our flower girl Sidney Apthorp. They singlehandedly put out so many fires and fixed so many issues, often before I realized it was a problem. 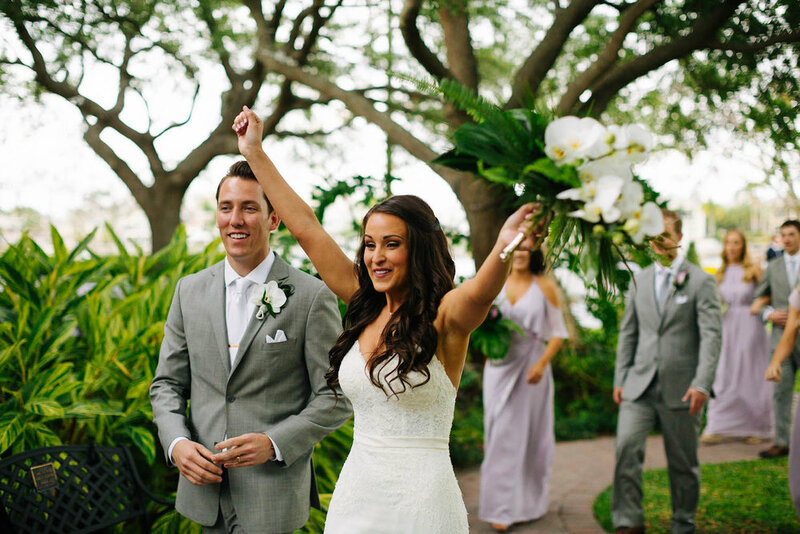 Joey & Tatiana's wedding at the Palmetto Club featured beautiful florals by Botanica Florist, sweet moments shared between friends and families, and of course, a stunning bride and groom! 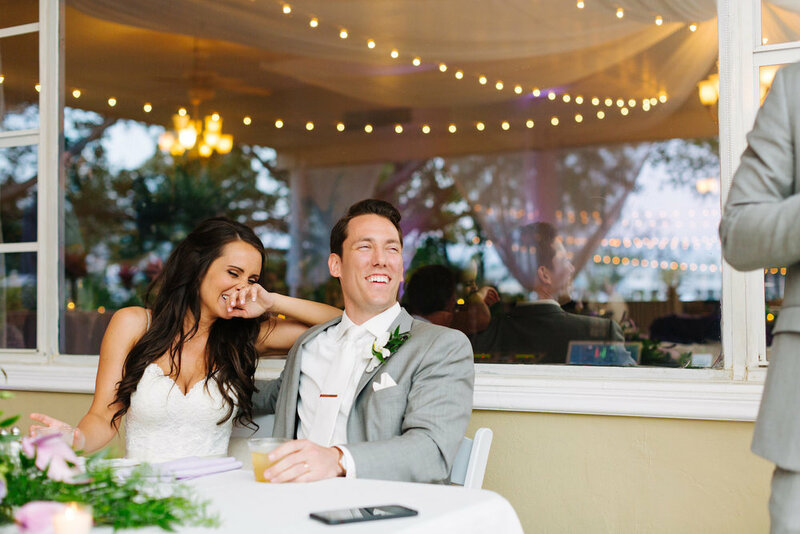 Joey & Tatiana chose the Palmetto Club because "the idea that both ceremony and reception were both in the same location was so ideal. 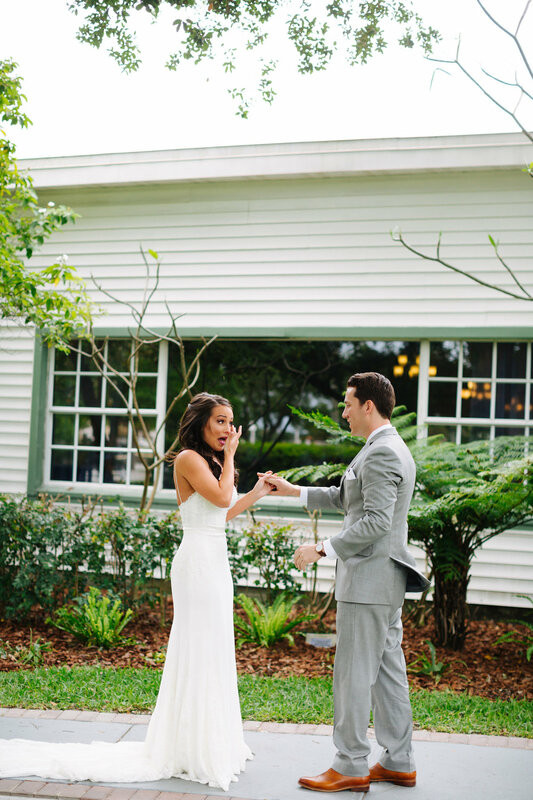 and especially since an outdoor ceremony was important to us, the garden area was perfect! 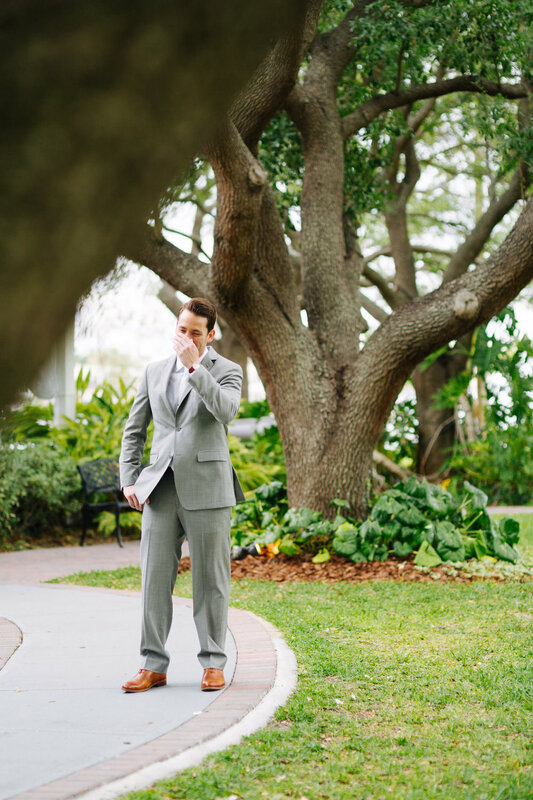 "My groomsmen wore the same tuxedos as me and the socks were all FSU, although some were garnet and some were gold. 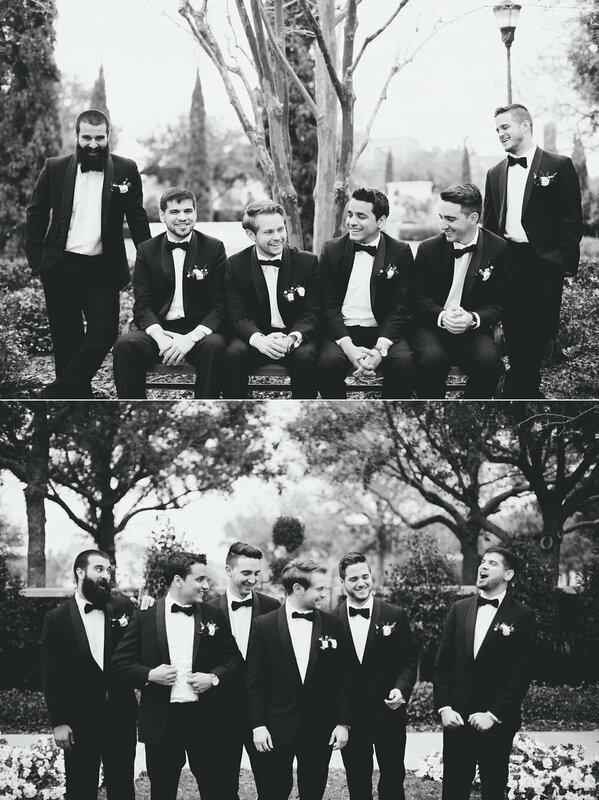 I chose these men as my groomsmen because they were my best friends in college and the guys I still enjoy escaping reality with to have a good time. I chose a very traditional black and white look for my tuxedo with a bow tie. This mirrors my personality and values being traditional and wanting a classic wedding. We did have FSU socks for myself and groomsmen which we took many pictures with and had a great time showing off." These girls have been my number one choice for the past 4 years. I knew they would be by my side no matter what. I love them each beyond words, and they are the most special people to me. They wore beautiful Monique Lhuillier dresses that were flowy and fit each and every one of them so well! Everything else was their choice :) They all have amazing taste and I trusted them with whatever they chose!" 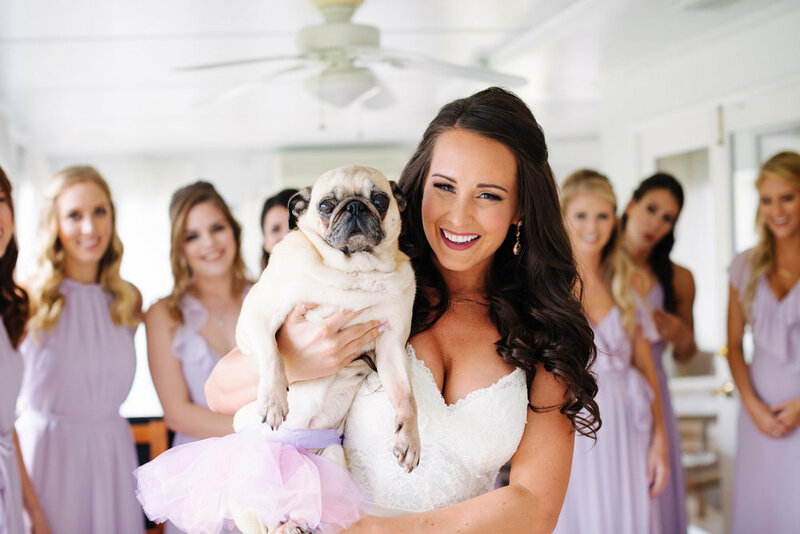 Tatiana purchased her dress at Emelina's Bridal Boutique here in Tampa. 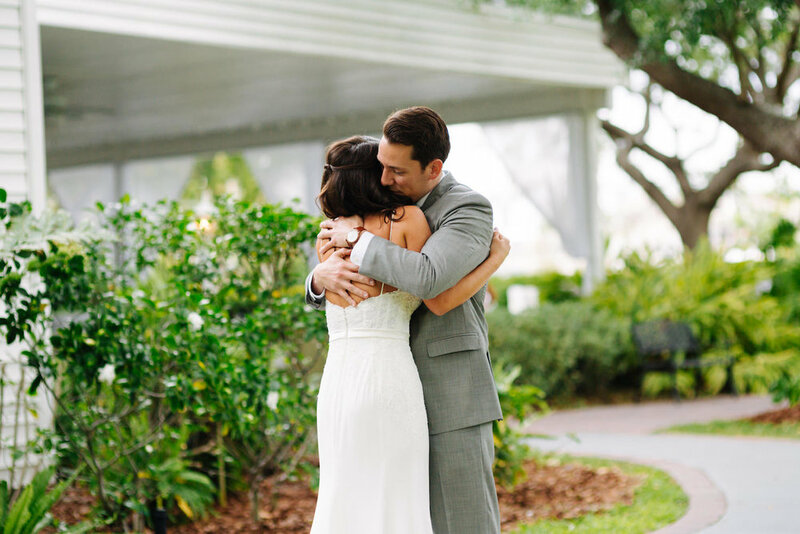 "We went traditional with our vows. 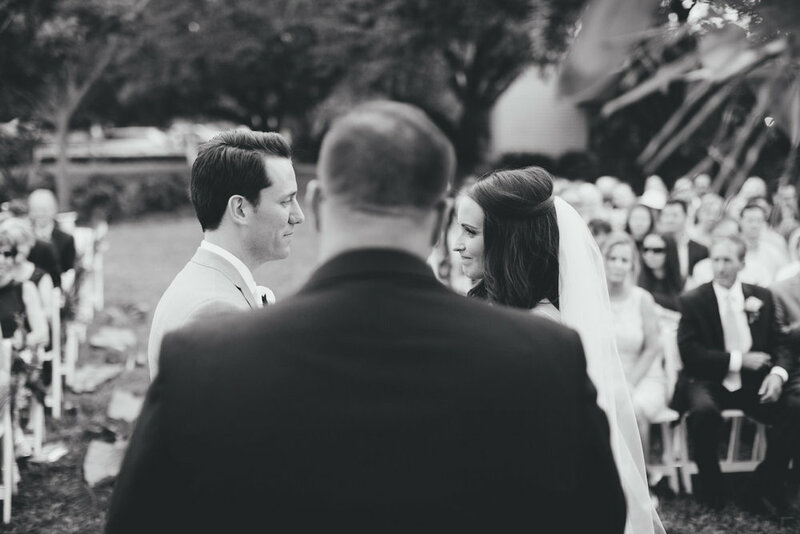 Saying those vows to us meant the world and we're so glad we did. 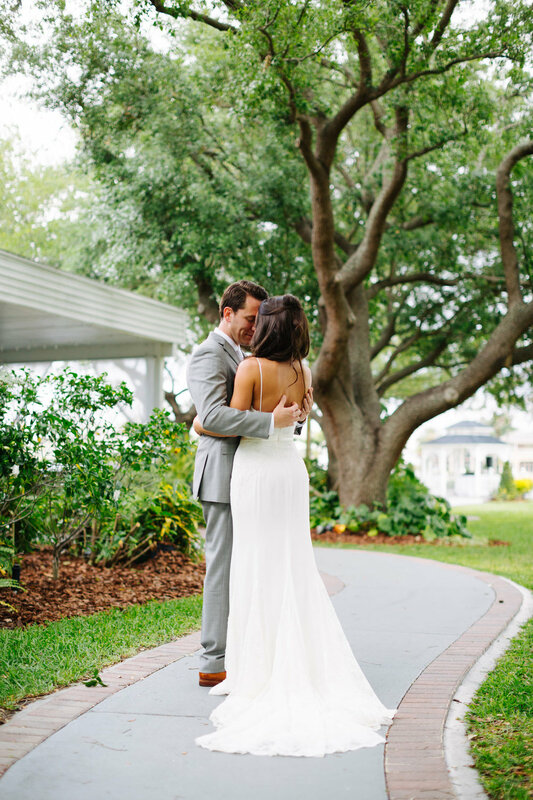 Something we added that is nontraditional were our vows to not divorce. After doing our pre-marital classes we both agreed that divorce is never an option, and that we wanted our vows to include that promise we were not only making to each other but most importantly to God!" -Seeing all our friends together in the same place after so much time. It was so extremely heartwarming. 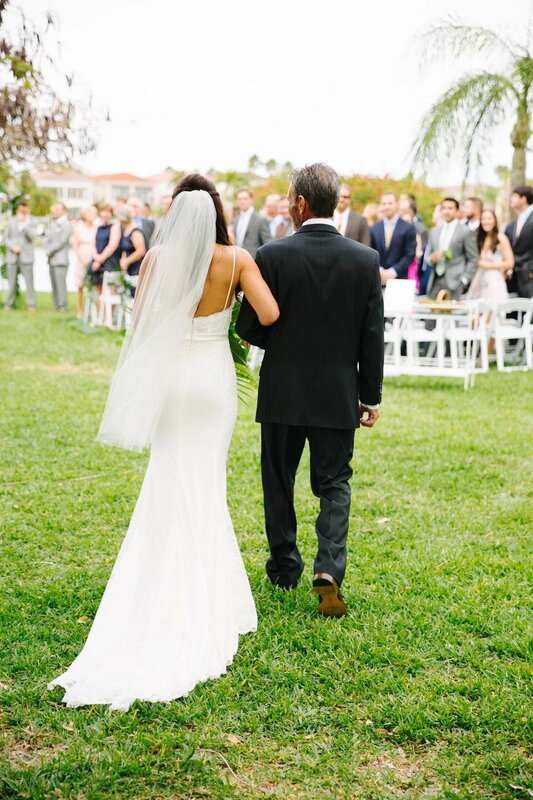 -Walking down the aisle was definitely a big one. You think about that moment growing up and play it out in your head countless times but don't realize just how special and amazing it us until the moment finally comes. -The speeches given by our best man/maid of honor and mom. They were so extremely special to us and really reminded us of just how amazing of a life we've had. 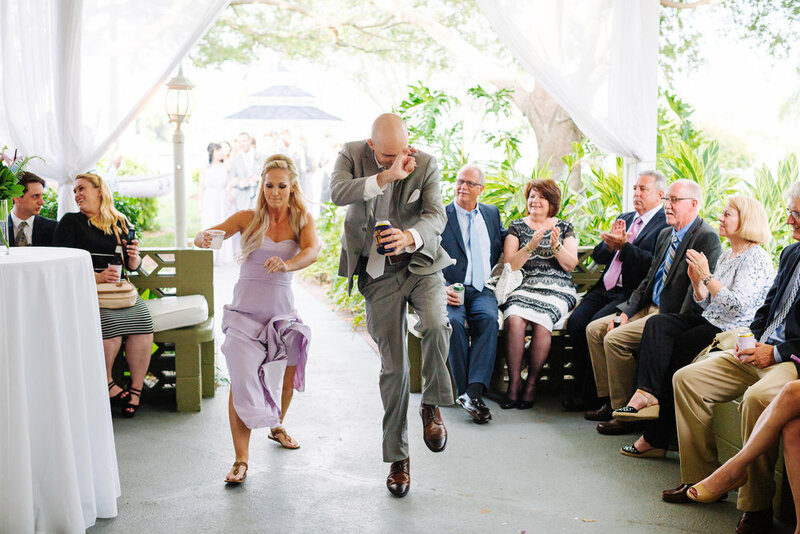 What were some of the funniest memories from your wedding day? -Taking the bride's garter off. We were both so awkward about it and did not want to do it haha so it was funny trying to be awkwardly discreet about it! Is there anything you wish you knew? -How quickly it all goes by. Mind you, so many people tell you that, but you never really believe it. Or you say "Oh, I'll do x, y, and z differently" but it doesn't matter how prepared you think you'll be, it all rushes by! Enjoy every single second. For me, it was also an opportunity to have all my best friends together, in the same state, at the same time, getting ready with all of them and loving on them. Take it all in. Appreciate every second of it. This moment is such an amazing one it your life. Stay positive! Don't let the little things get to you- they're probably not that big of a deal. And remember- you get to marry your best friend!! Like that's pretty epic on the scale of "Epic Life Moments." I look back and everything was exactly as I had planned. Just be yourself and remain as calm as you can. 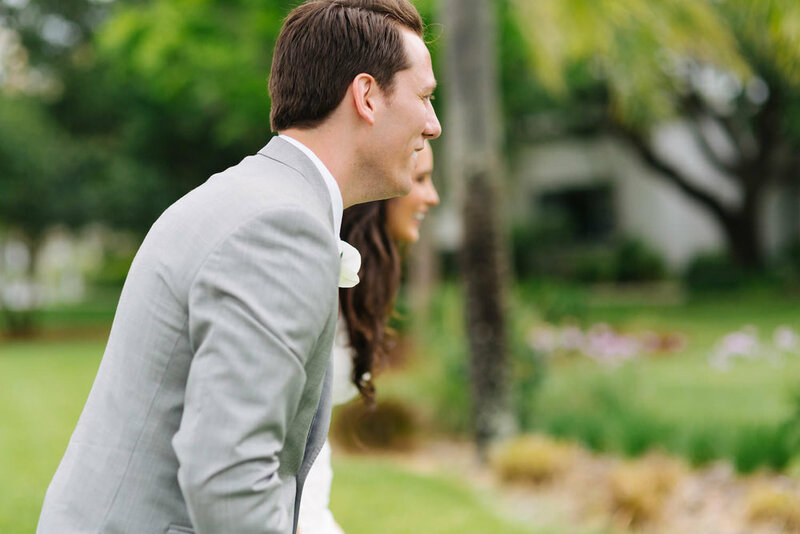 Take an extra second or two to look at your wife after saying I do and as much as you can, slow down time because the wedding flies by so quickly. 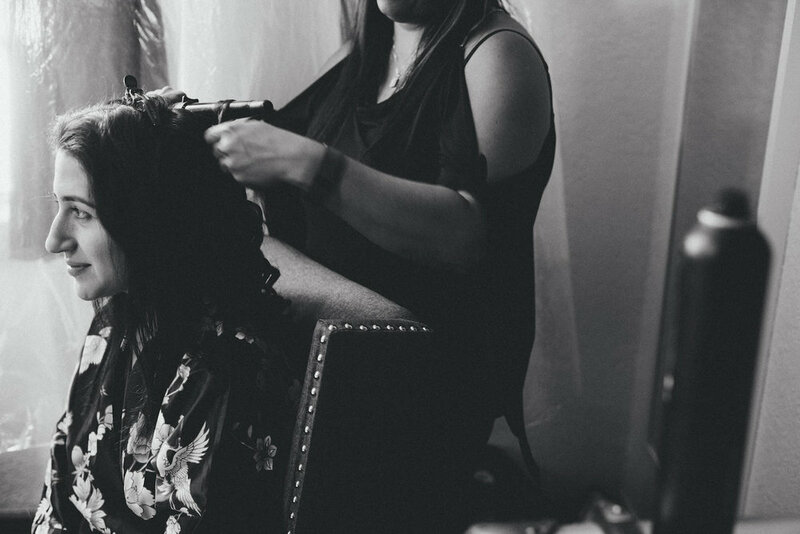 HUGE thank you to Bride's mom, Patricia Gutierrez, for the countless hours of work she put in, the amount of time she dedicated to our wedding. To the year and a half of planning that she was equally as invested in as I was. Her love, support, and "mom-ness" are things we could not have made it through without. To Tim and Tammy, you put in so many hours of travel, so much time, so much love... so much of yourselves! to be a huge support for us. Your loving advice and words of wisdom will never be forgotten and we will try to live them daily! 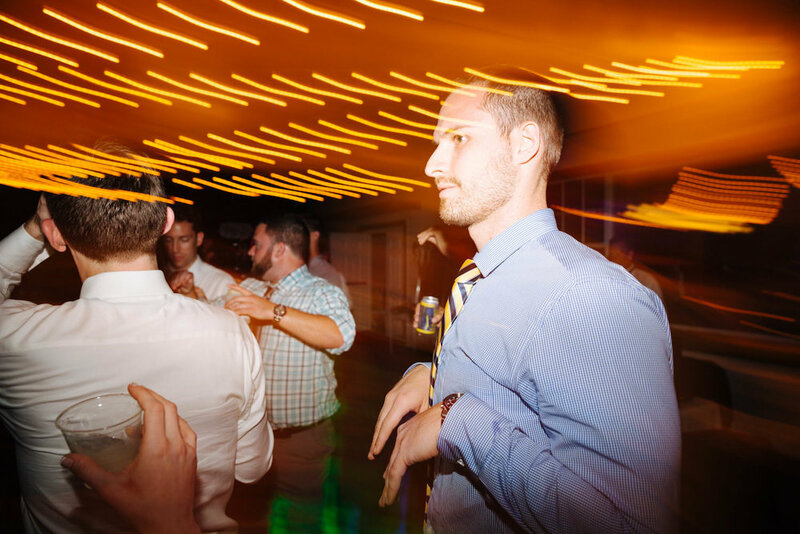 To Michael Mellette, you nailed the best man speech! That was hilarious and really filled the room with laughter. I know how nervous you were and when I look back that is one of my most memorable parts of the reception even though I can't remember all that was said. To our Bridal crew- you all rock! All of you went above and beyond for us and reminded us of how lucky we are to be pretty much the best group of friends out there. Matthew & Kelly are hands down, without a doubt, two of the kindest people in the world. 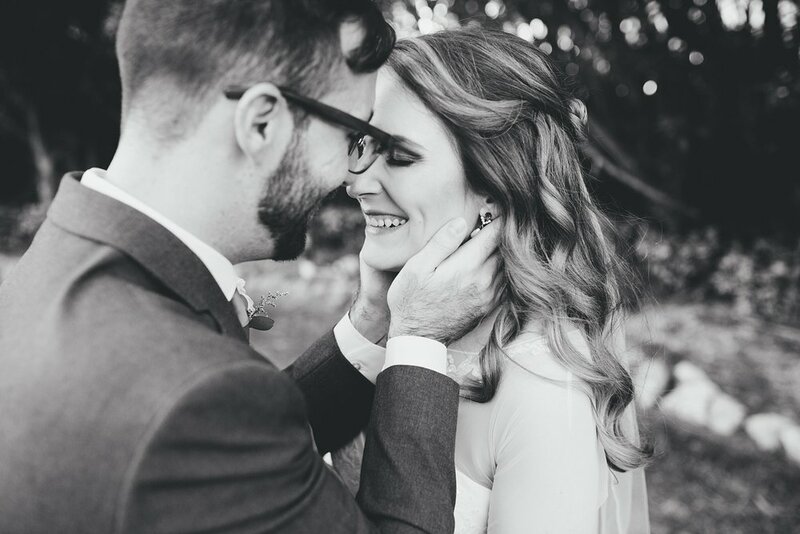 We loved every minute we got to spend with them from our first meeting, to their engagement session to their wedding day! 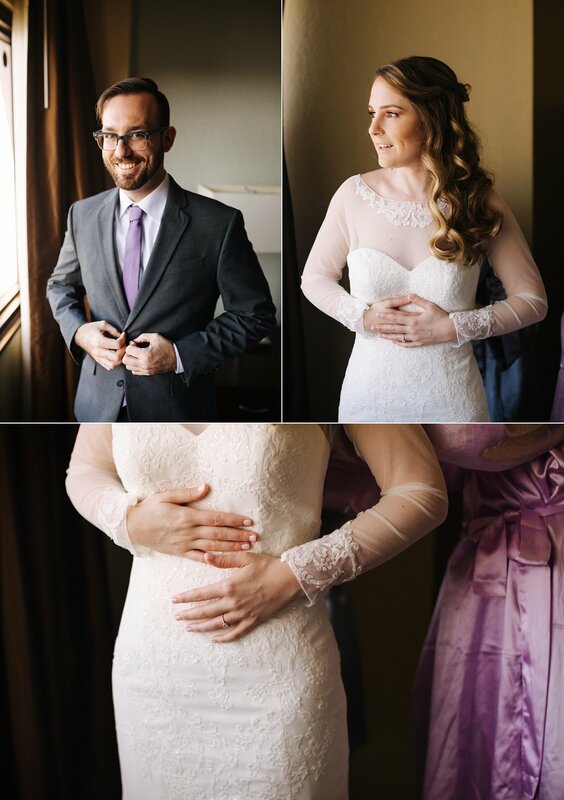 Please enjoy some of our favorites from their wedding day. 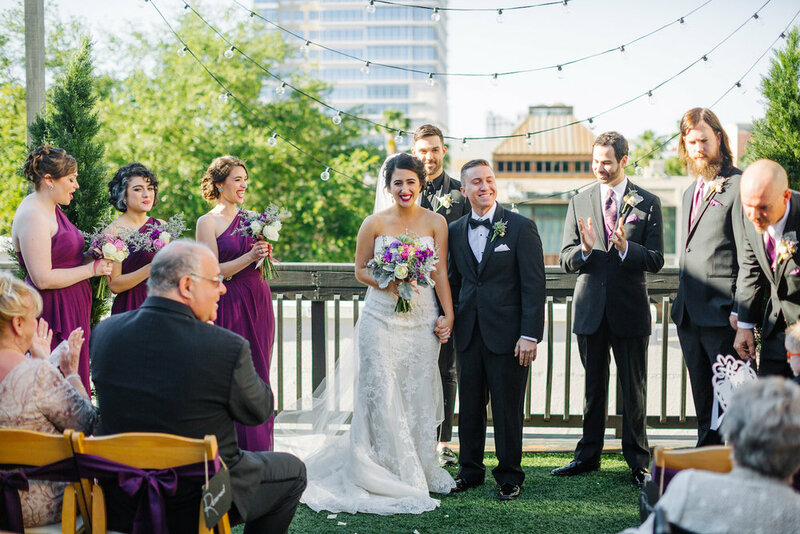 Why did you choose this venue for your ceremony? 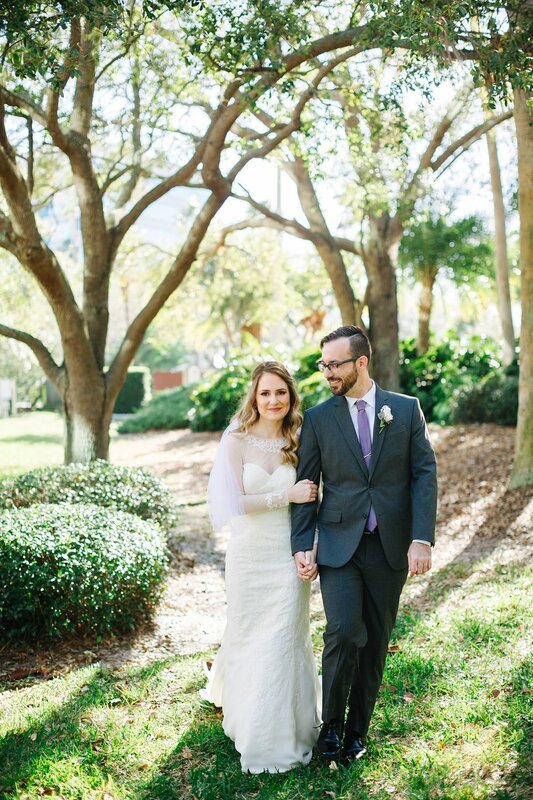 We met in high school, so the chapel where we met just seemed like the natural place to get married. We also liked that it was a smaller, more intimate venue. 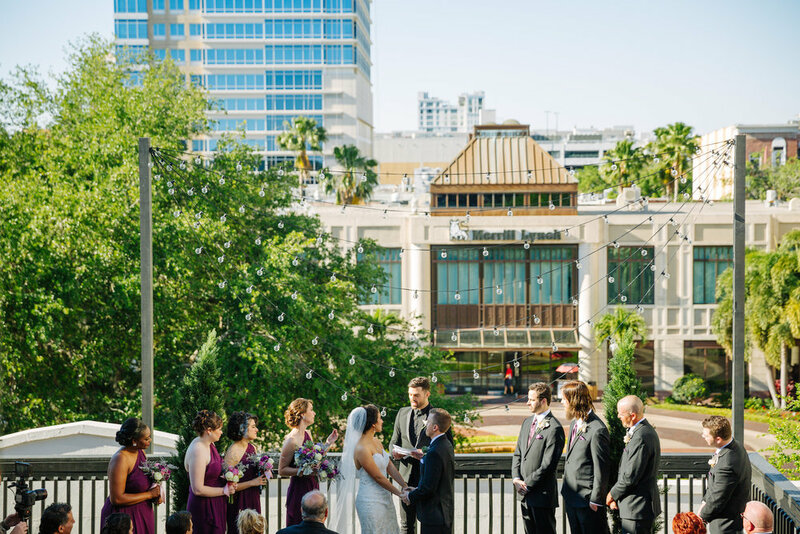 Why did you choose this venue for your reception? We both love the water, so we knew we definitely wanted something by the water. The Sarasota Yacht Club is a beautiful spot for just that. 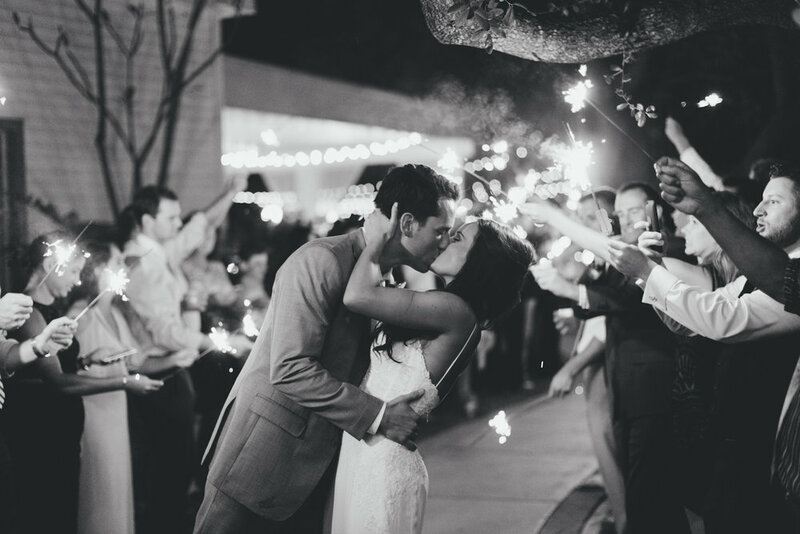 What were some of your favorite memories from your wedding day? We had a few chances to sneak away from all the business of the day while we were at our reception – first we went out by our friend’s boat and they have a light that allows you to see beneath the boat – we were able to see really big Snook which was awesome! Also, walking back from this same little excursion, Jake caught us and made us stop for a minute and dance for some pictures which ended up being a very much needed nice and refreshing moment to ourselves. 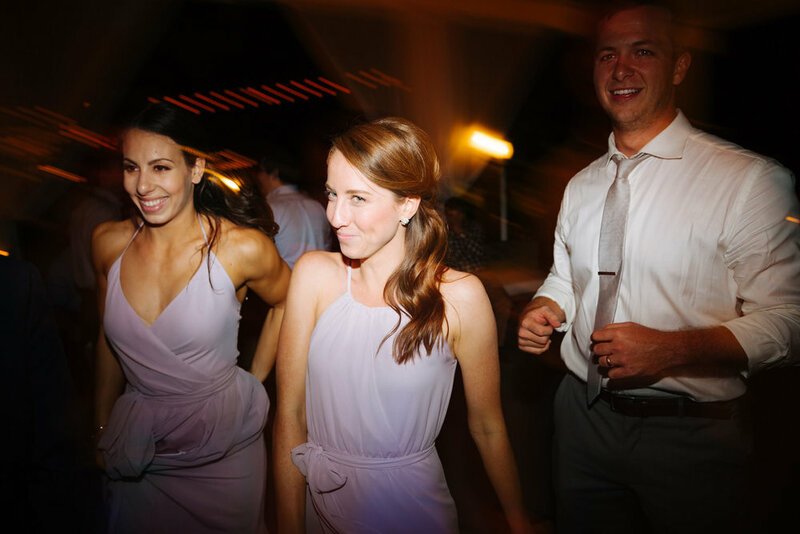 Kelly: Dancing with my flower girls before the ceremony started – we were there super early, and I was really nervous and quiet. One of my little flower girls suggested with listen to Taylor Swift (Shake It Off, of course), so we did and we danced and it helped me relax a lot. 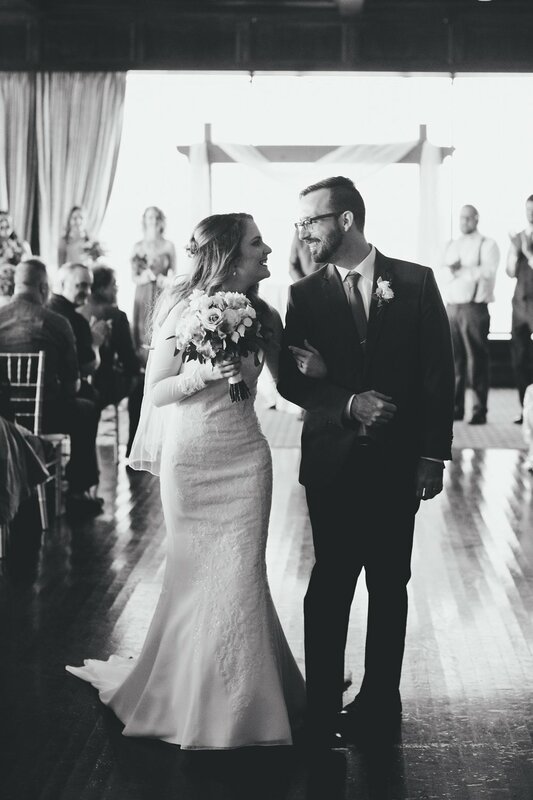 Kelly & Matthew: When we were announced for the first time as husband and wife and recessed out of the chapel, turning around and having all of your family and friends cheering for you was one of the most amazing experiences. 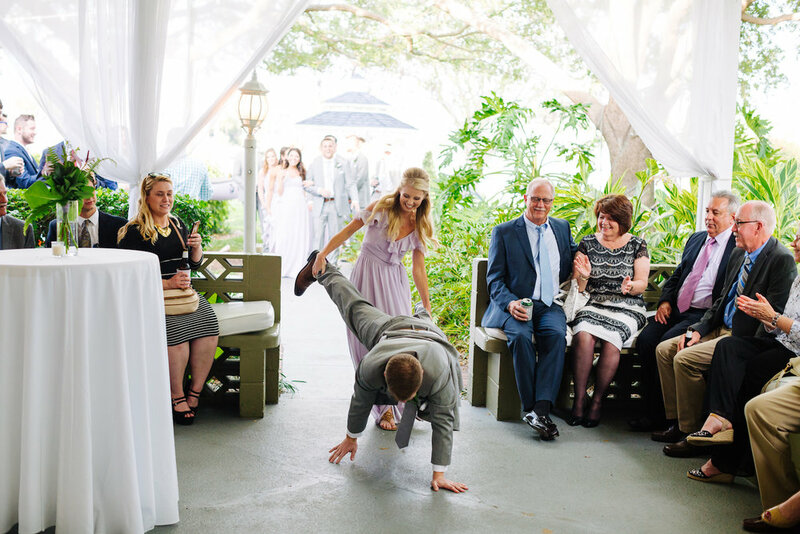 What were some of the funniest memories from your wedding day? Someone told Kelly how impressed they were that she was able to finish so much of her filet, but little did they know most of it went to our four year old niece who kept coming up and stealing it! She will literally eat anything, and we love her for it. Also, the trolley in general. 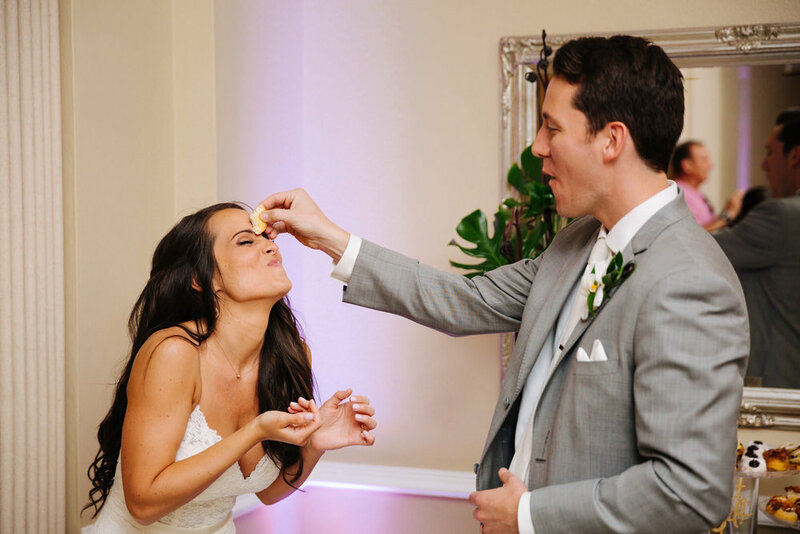 Everyone should have Chick-Fil-A nuggets and champagne at their wedding. 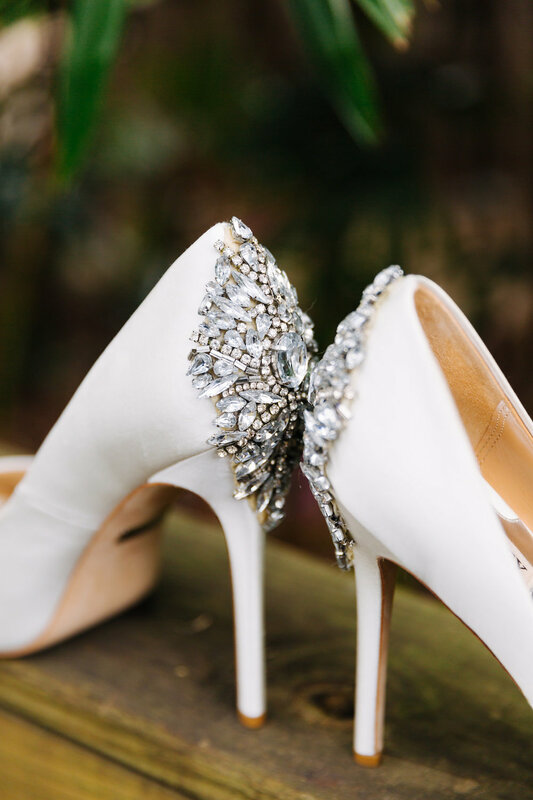 What is something that happened on your wedding day that you didn't expect? As we mentioned earlier, we were very overwhelmed and truly touched when we were announced as husband and wife and everyone cheered for us. Katie had actually mentioned to us earlier that walking down the aisle reminded her very much of the ending of Big Fish, and that was the perfect analogy. Katie said it was going to be awesome, but we were really blown away. 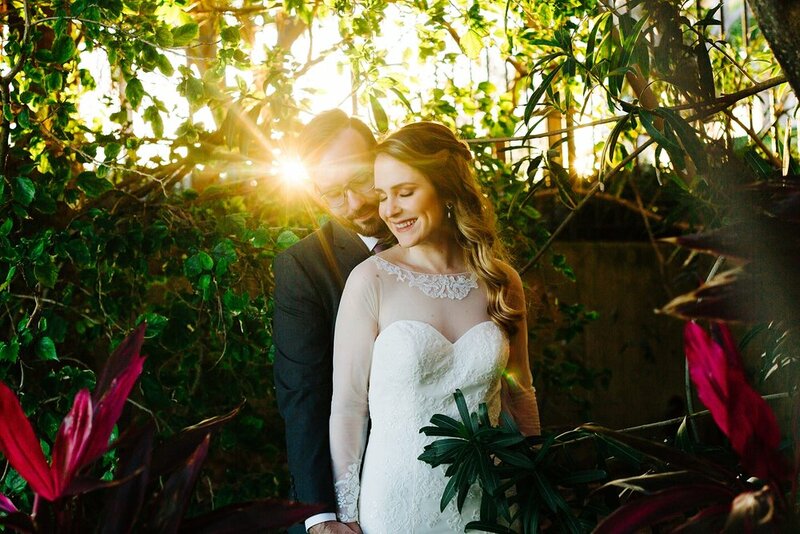 We also did not expect it to be so warm that day, but thankfully we were inside for most of the day and it was very sunny! 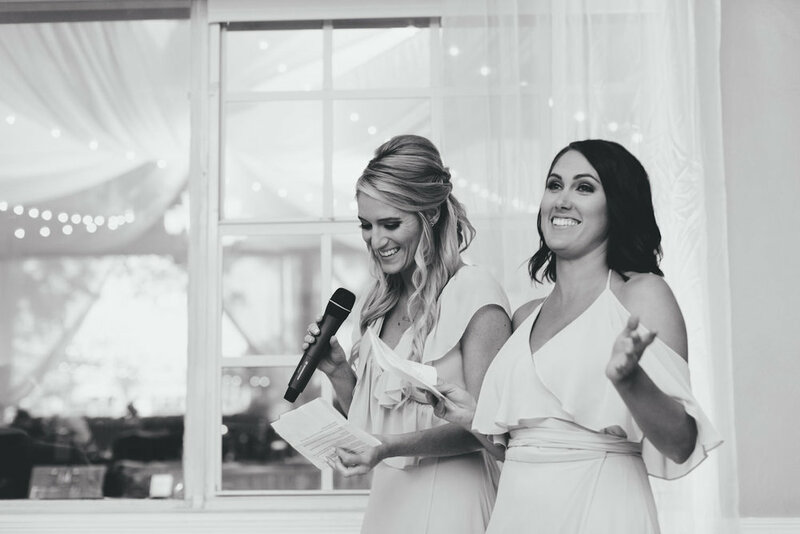 Advice for future brides: Remember that as long as you end up married to your best friend at the end of the day, the goal is accomplished and anything that may go wrong does not matter. 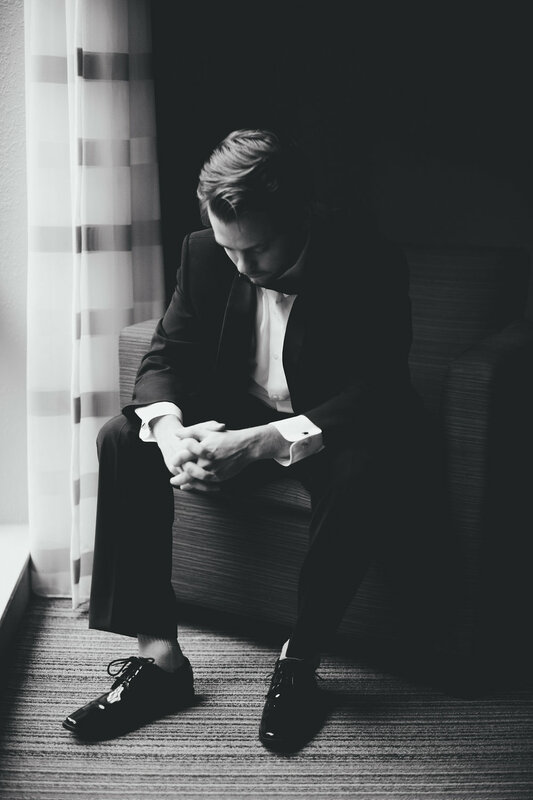 Advice for future grooms: Keep in mind what the wedding is actually about, and try not to get caught up in all minutia of the day. Thanks goes out to... Our family, friends, and all those who attended and supported us through the whole process. 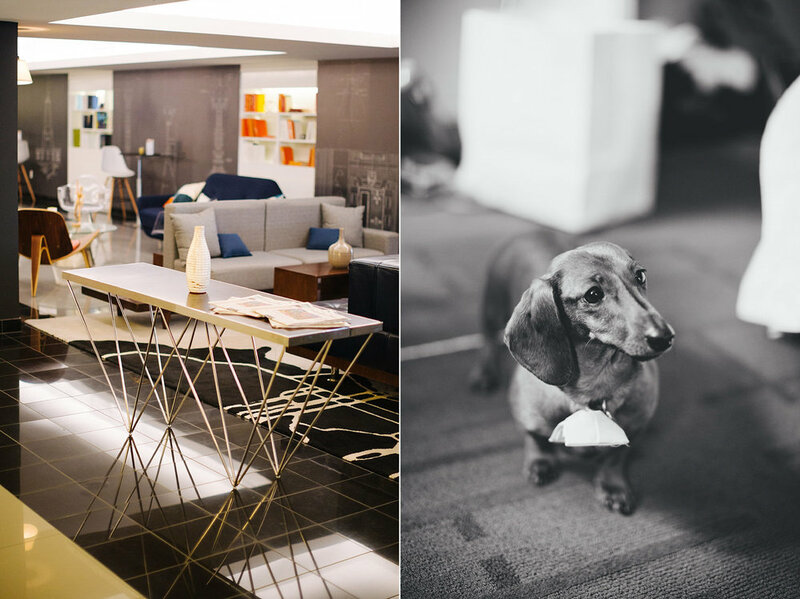 Also, thanks to all our vendors, especially Jake & Katie for some awesome pictures! The Bride. 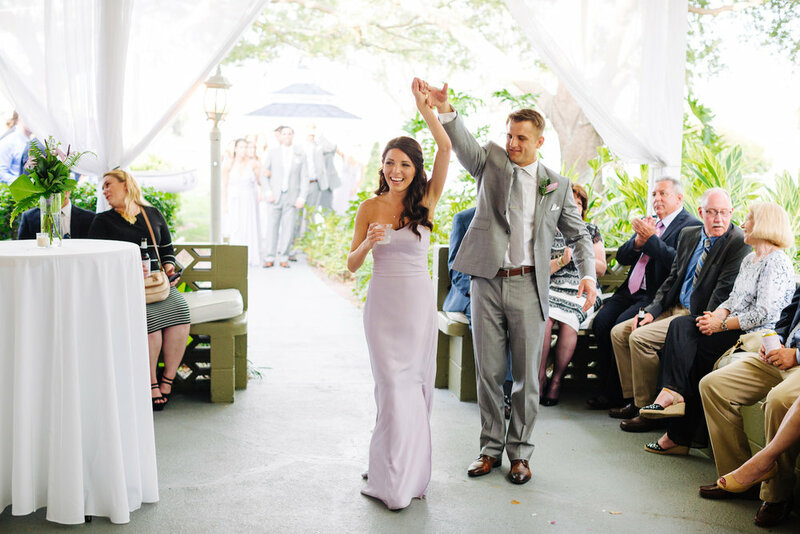 My dress was from Something Blue Bridal in Bradenton, where both of my now sisters-in-law got their wedding dresses as well. I had my sorority pin knit in beneath the belt of the dress which was a fun little surprise! I wanted beautiful, but low and comfortable shoes, so I was very thrilled with the ones I found. 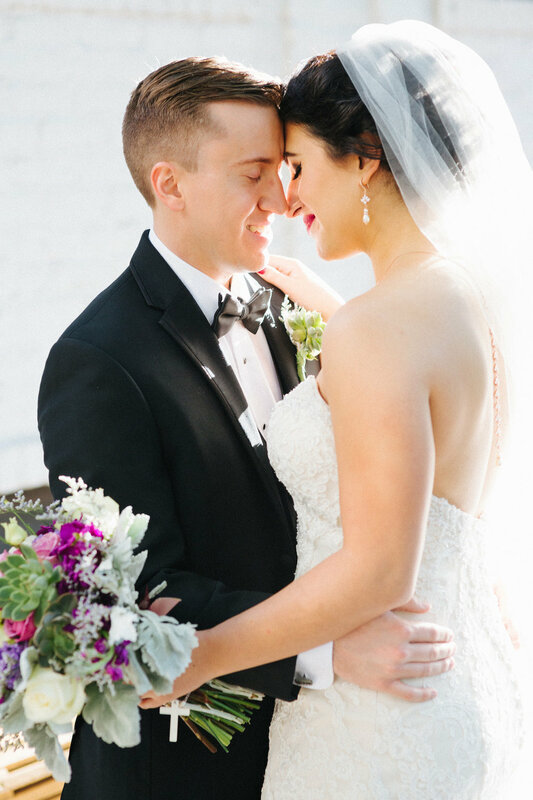 A lot of my other details were borrowed – my necklace was from my mom, my earrings were from my aunt, my veil was from Matthew’s sister, my garter was from Matthew’s grandmother. I loved that I was fortunate enough to borrow all of these wonderful things from so many amazing women in my life. I am truly blessed to be surrounded by such inspiring women. 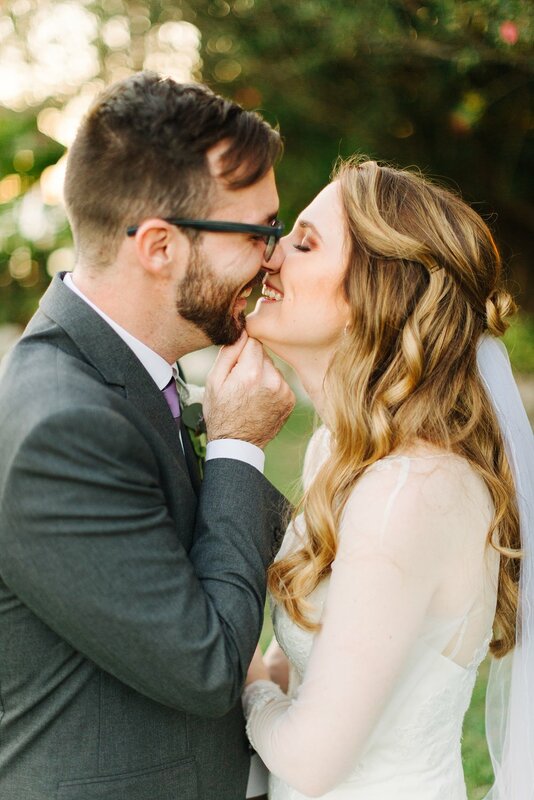 As for my hair and makeup, that was really all Matthew – he loves when I have bright red lips and my hair in a braid, so that’s what I did. The Groom. I tried to find a classic style that wouldn’t look ridiculous when I looked back at it in the distant future. I chose ivory shirts to match Kelly’s dress. The Music. 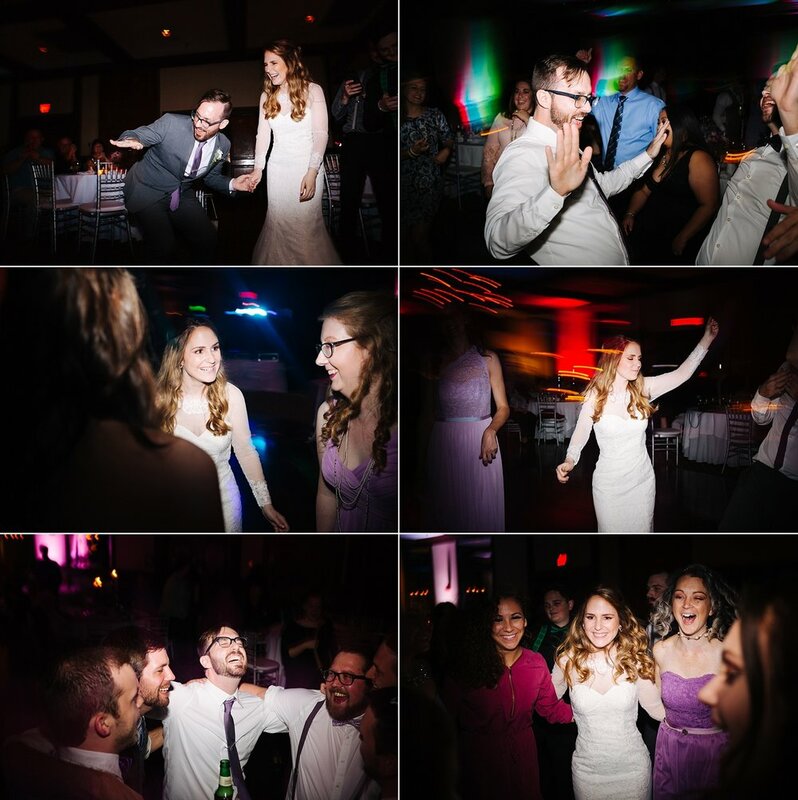 For the reception, we chose “Book of Love” to dance to – one of our favorite artists, Gareth Asher, does a cover of it that we really love, and we think the lyrics are beautiful. 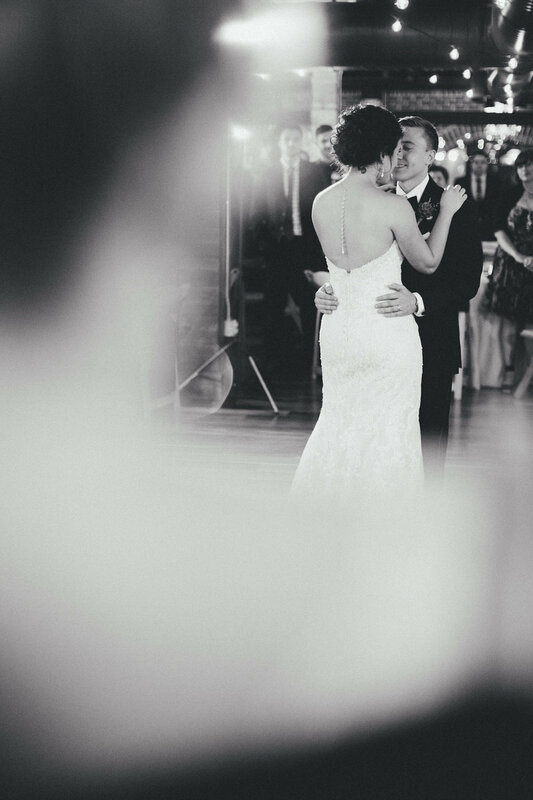 We also liked that it isn’t a very common song for a First Dance Song, but common enough that we will hear it from time to time. 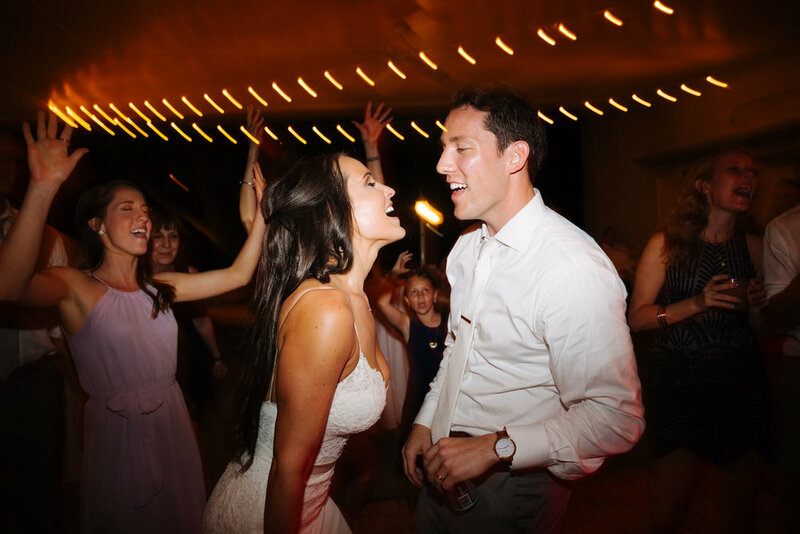 Kelly danced with her dad to “Brown Eyed Girl,” a song they have always danced to together because out of everyone in their immediate family, they are the only two with brown eyes. 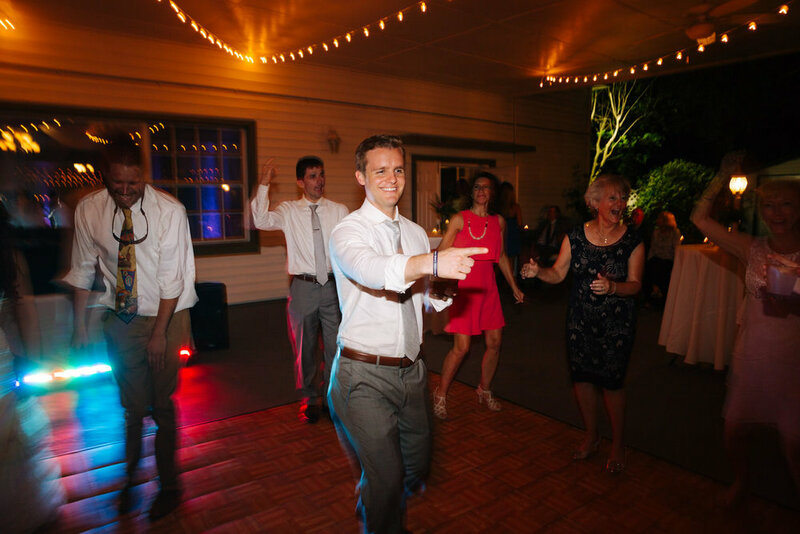 Matthew danced with his mom to “Somewhere Over the Rainbow” by Israel Kamakawiwoʻole. The Ceremony. 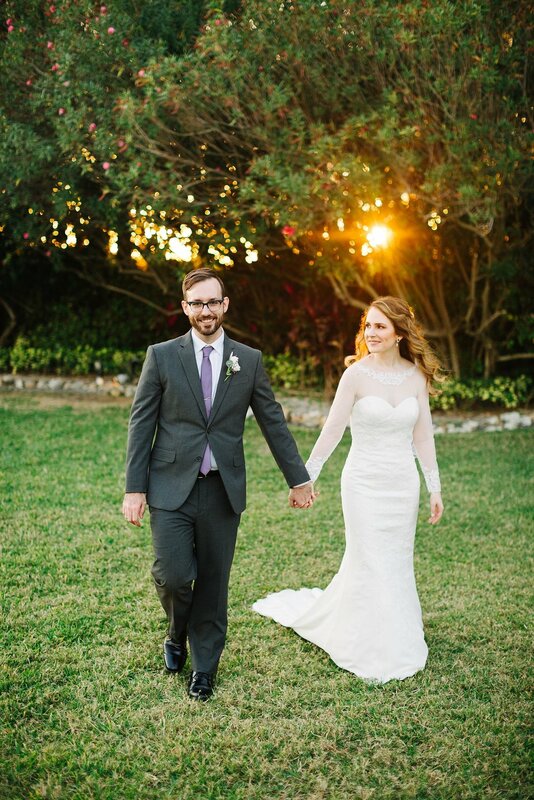 The Ceremony ended up being one of our favorite parts of the day. Our priest was the chaplain at our high school when we went there, so it was nice that he knew us both and really tailored his homily to us. We honestly felt that he gave us perfect marriage advice specific to us, and that is something we will never forget. The Reception. Our reception was a pretty typical reception with a Christmas spin! 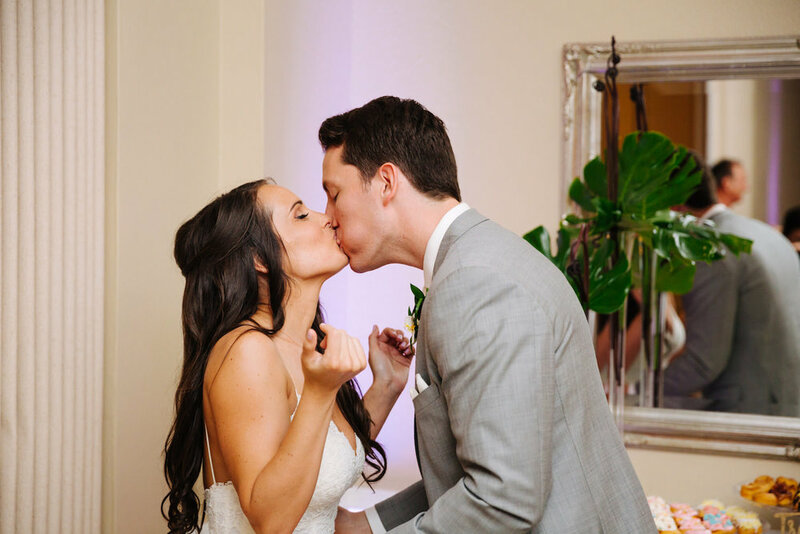 We had all the first dances, speeches, cake cutting, and garter and bouquet toss, but we had a few special surprises too! For instance, we had a “Glowstick Sendoff” and late night French Fries and spiked milkshakes (which were AMAZING), all of which was made even better by an amazing band and MC to tie it all together. Why did you choose this planner? Brittany was the coordinator at a friend's wedding I was a bridesmaid in, and I was so impressed by how she kept everyone so organized. Why did you choose this make up artist? Kelsey was a suggestion from Brittany - she is so sweet and did an amazing job! Why did you choose this bakery? This is a local bakery with the best cakes! So yummy and also beautiful. Why did you choose this DJ/band? Matthew found this band a few years ago when his sister was getting married. They were amazing then, and still amazing now!